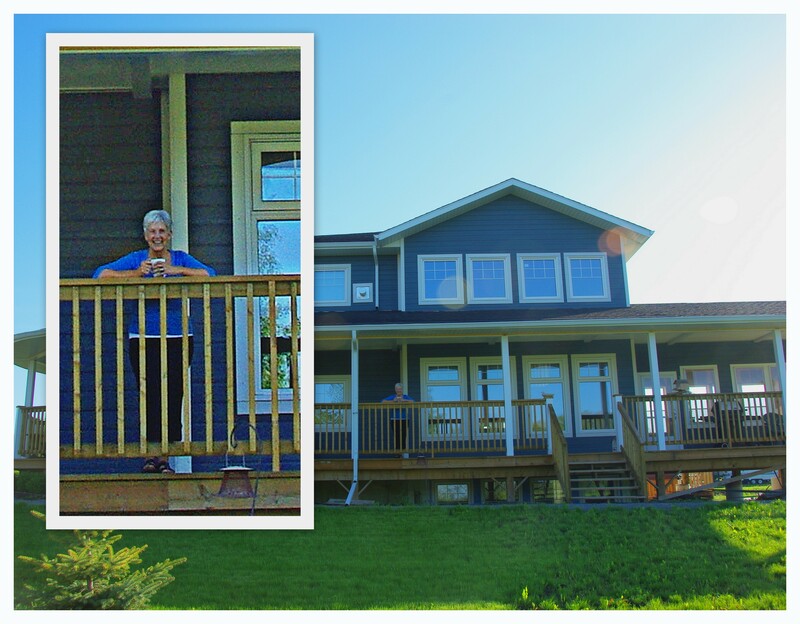 Steinbach | The Happy Wonderer ~ ellen b.
M is for the Mennonite Girls Can Cook! 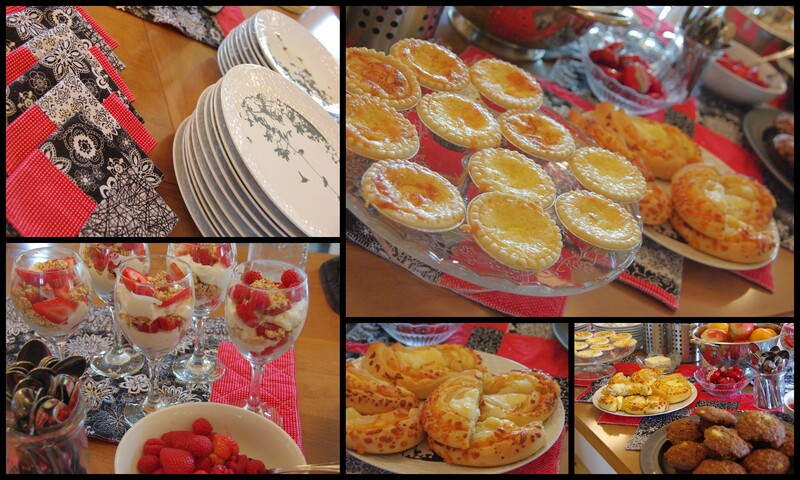 I am one of the ten girls who have a blog we collaborate on to post a recipe a day and a devotional on Sundays. 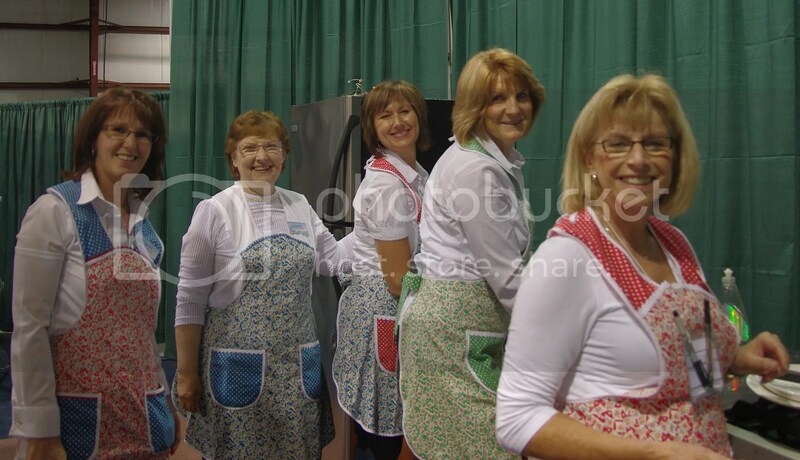 That blog is called Mennonite Girls Can Cook. 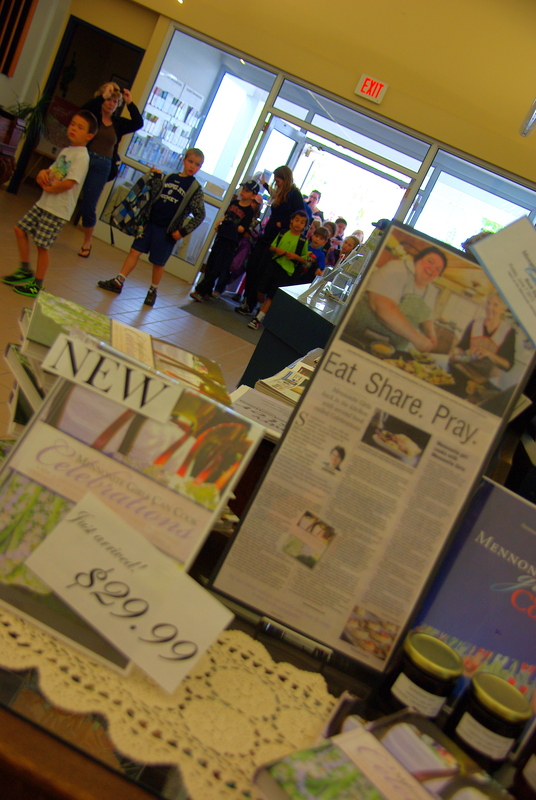 We also have two published cook books, Mennonite Girls Can Cook and Mennonite Girls Can Cook Celebrations. Both of these books are available on Amazon. 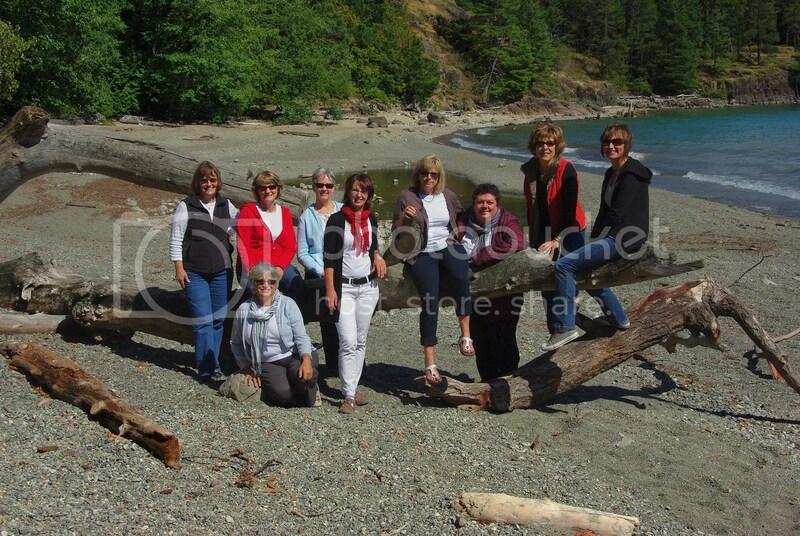 Anneliese, Judy, Lovella, Kathy, Bev, Betty, Ellen, Julie, Charlotte, and Marg. Sometimes my meme buddies think that MGCC is my blog and all the recipes are mine because of my blogger comment link that will take you straight to MGCC. If your blog has the (name/url) option to click on when I comment everything works great for memes because I can put in the url that will take you straight to my ABC Wednesday post, etc. My personal blog is The Happy Wonderer, ellen b. but blogger/google has hijacked me and will send you straight to the MGCC blog if you click on my comment name when I don’t have another option in commenting. Does that make sense? 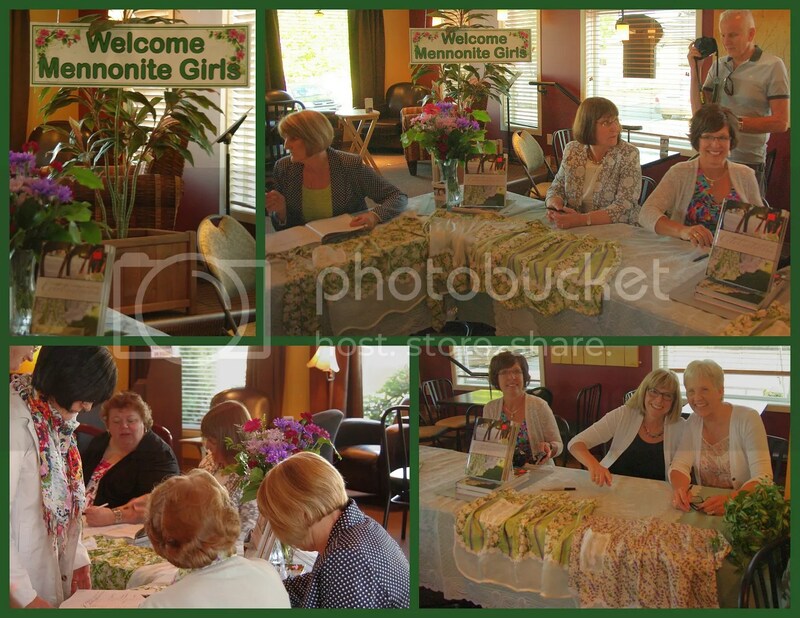 Enough of that…back to the Mennonite Girls. 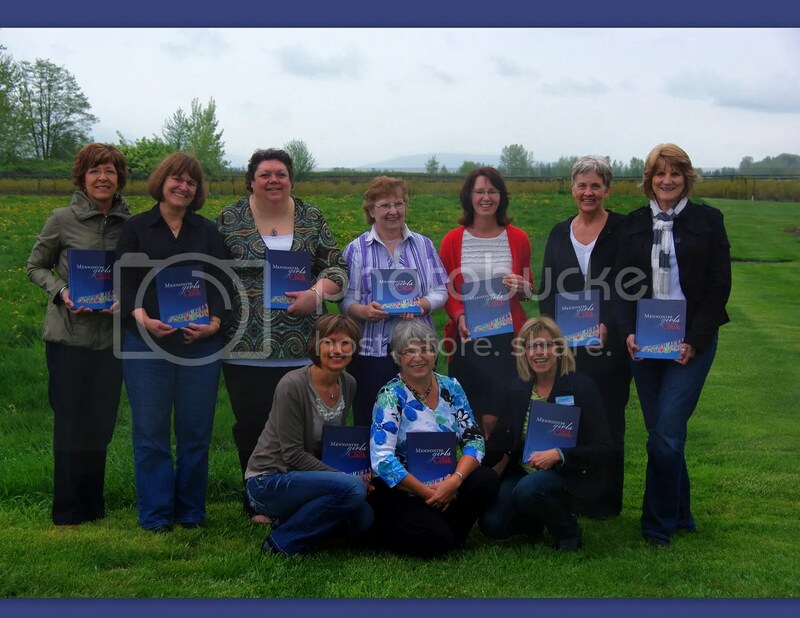 In 2010 all ten of us got together for the very first time to sign the contract for our first cookbook. Nine Canadians and one American, me. The nine Canadians hail from Abbotsford, Chilliwack, Winnipeg and Steinbach. 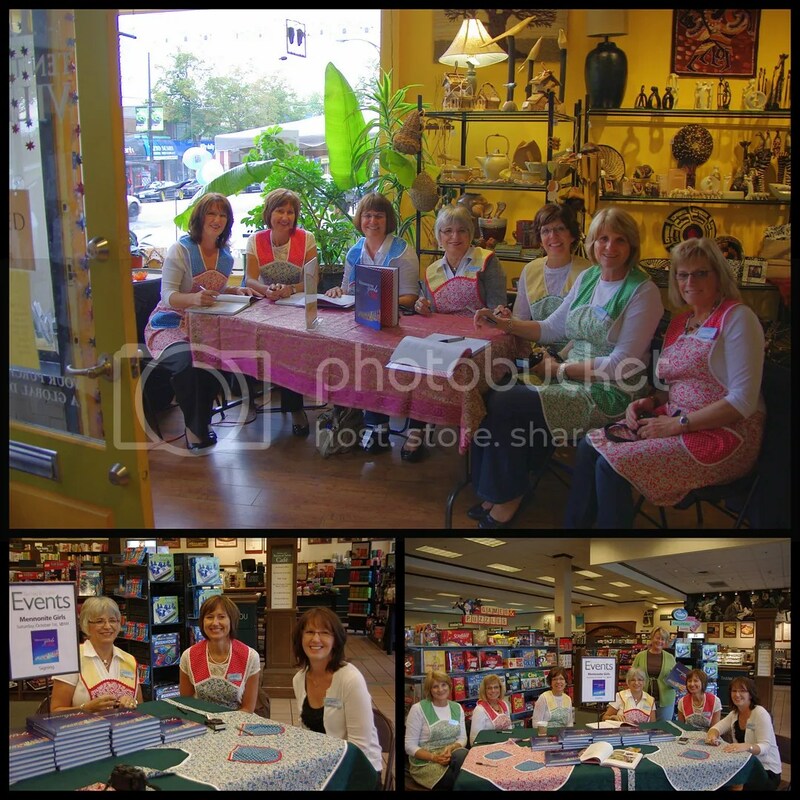 Barnes and Noble in Bellingham and Ten Thousand Villages in Vancouver. 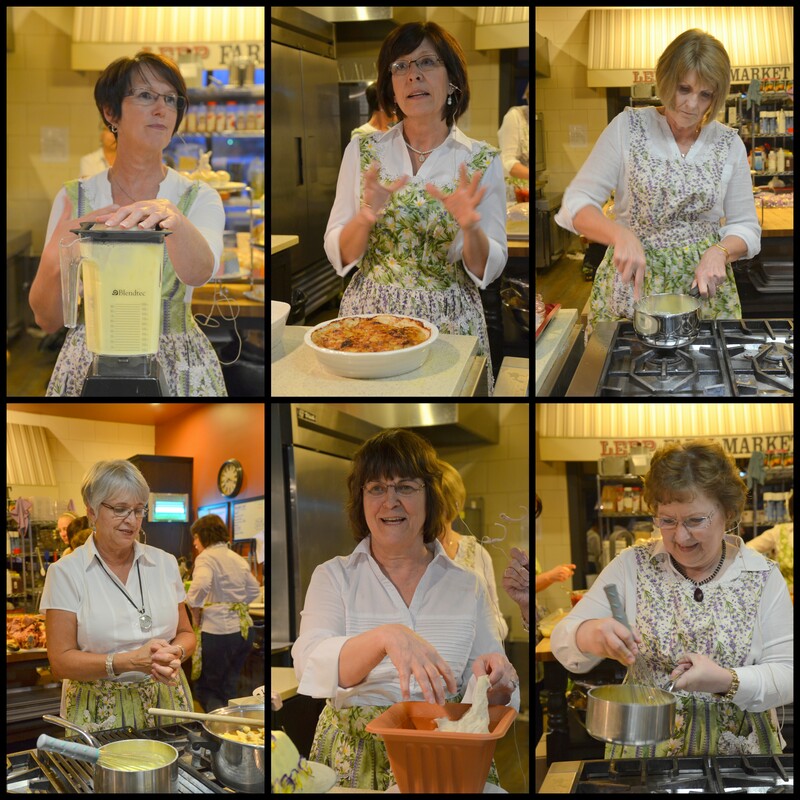 We’ve also done cooking demonstrations at the West Coast Women’s Show, Lepp Farm Market, Mennonite Relief Sales and on Global T.V. 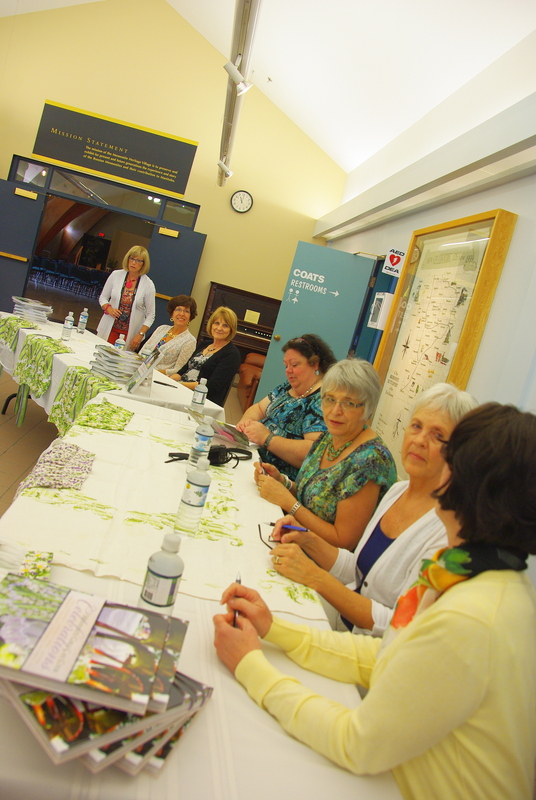 In July of 2012 we signed a contract for our second book “Celebrations” which would be released in Spring of 2013. Since this book was first published the cover has changed. 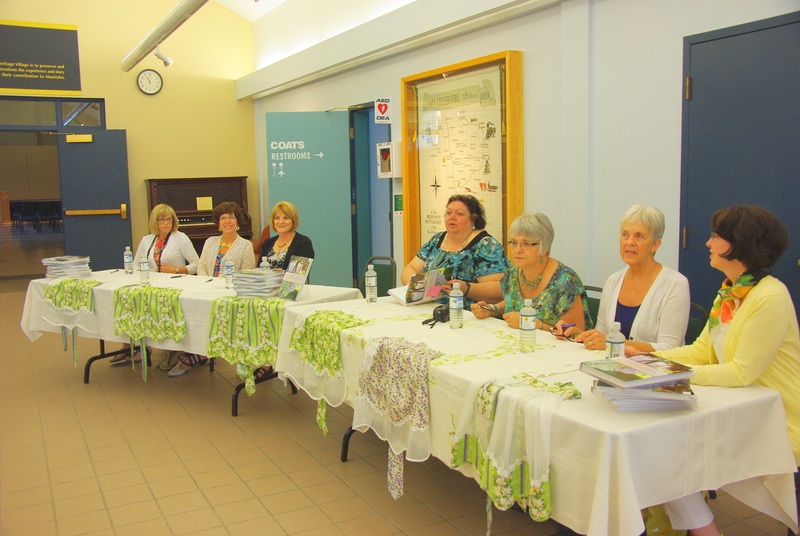 The West Coast girls traveled to Manitoba for book signings at several locations around Winnipeg and Steinbach so Charlotte and Betty were our hostesses for this great trip. I drove up to Abbotsford, B.C. to hop on a plane with the west coast girls for this trip to Winnipeg. 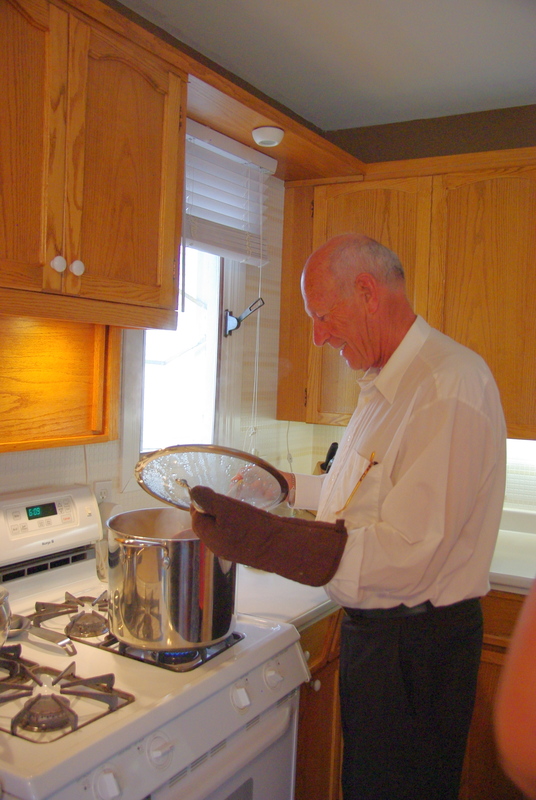 I never dreamed blogging would bring this whole new world of Mennonites and Cookbooks into my life. 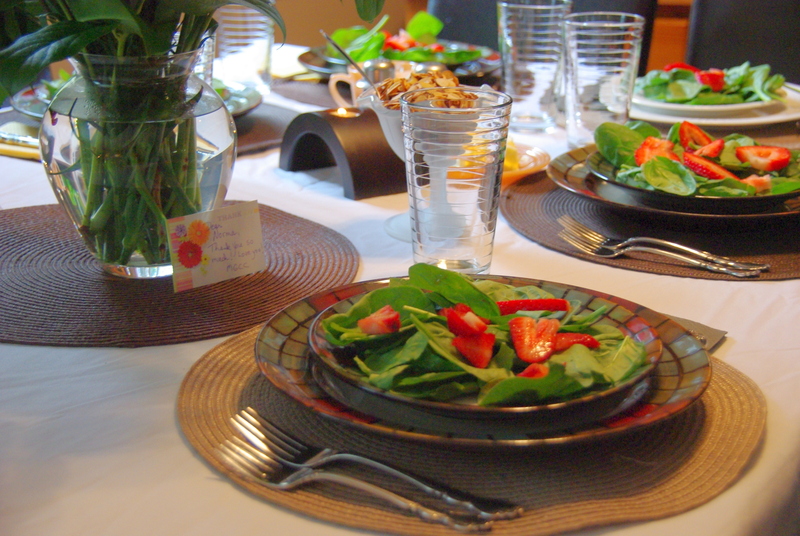 This journey started with me contributing some recipes to the newly formed Mennonite Girls Can Cook blog that was inspired by a Paska Post on Lovella’s blog. 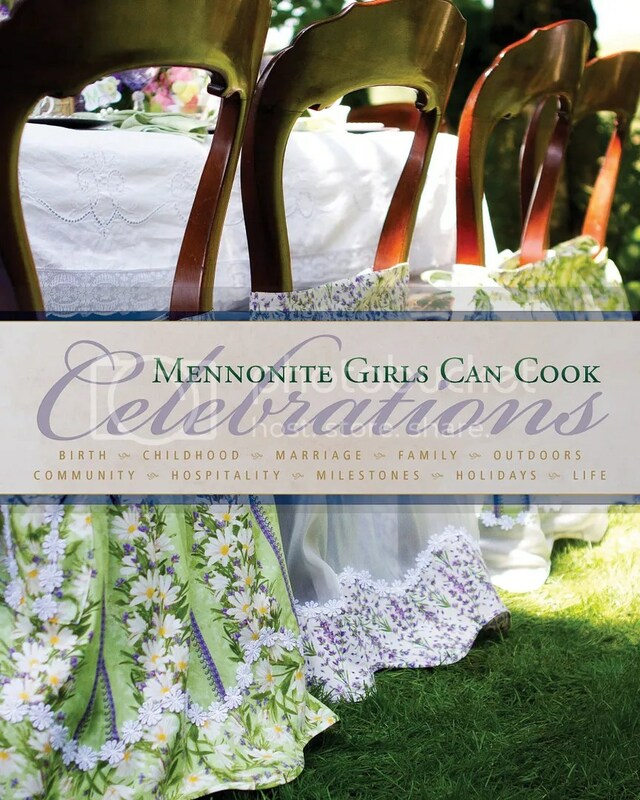 Because the girls and I have family recipes that are very similar I was invited to be one of the contributors on the newly formed Mennonite Girls Can Cook blog even though I am not Mennonite. 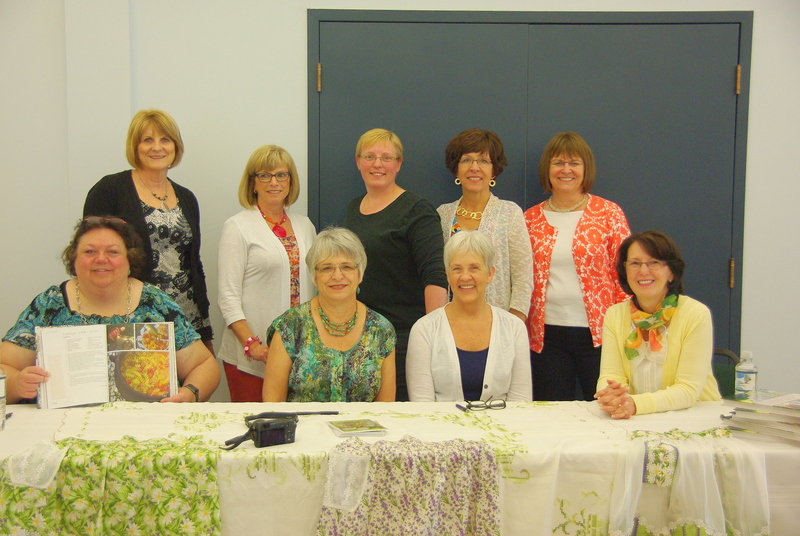 The ten of us remained faithful to the blog and soon a publisher came knocking at our door. 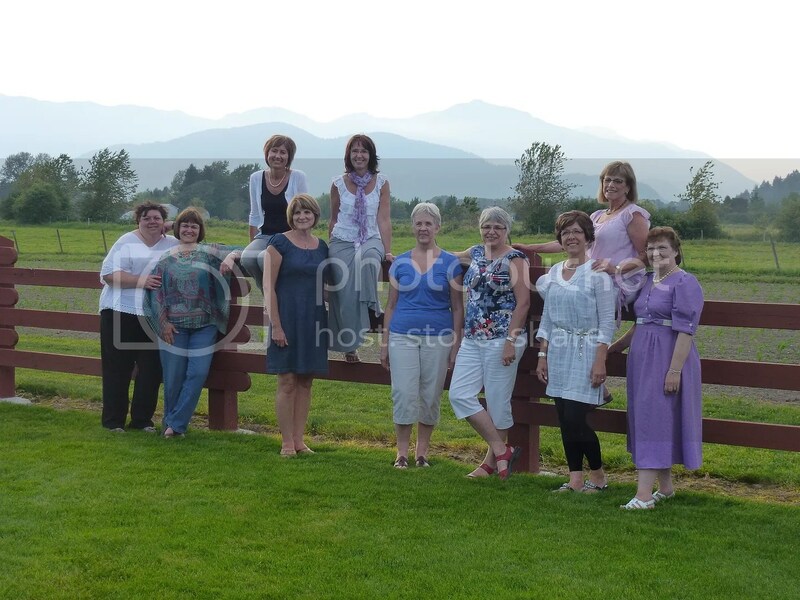 Beyond publishing and blogging we have formed lifetime friendships with each other. The girls call me their adopted American cousin. It’s not just the girls who enjoy our times together. Our husbands get to come along for the ride, too. 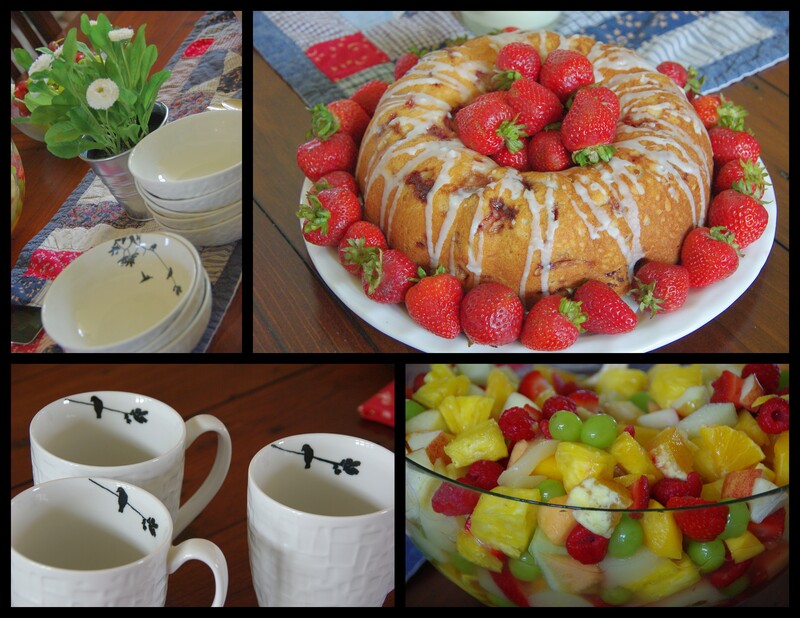 We get together for events that have nothing to do with our cooking blog, too, but there is always good food to be eaten whenever we gather together!! All this fun has not stopped yet because in August we will be published again with a smaller Devotional book with some recipes included. I’m linking up to ABC Wednesday started by Mrs. Nesbitt and carried on by the masterful Roger and the ABC team. Thank you! This and that from the rest of our time in Manitoba…and of course food is involved. These events are not in any particular order. 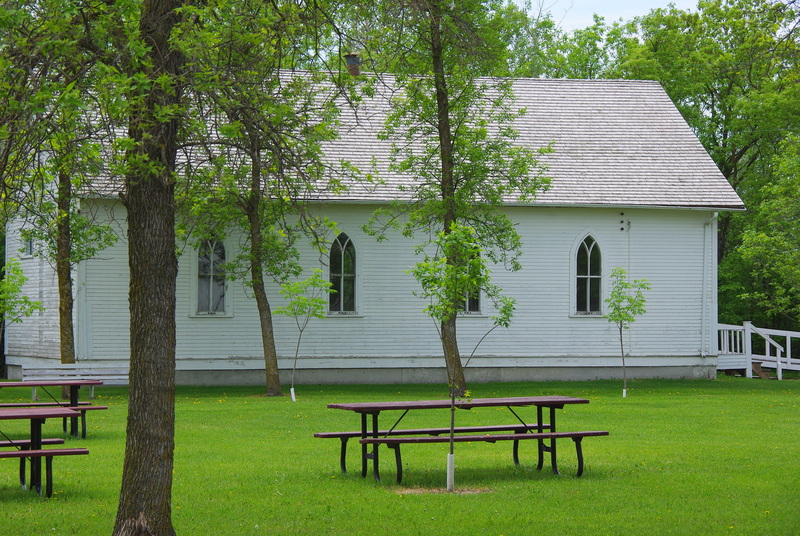 This was the Retreat Center that we stayed in during our time in Manitoba. Our last morning there we took our coffee out on the wrap around porch. 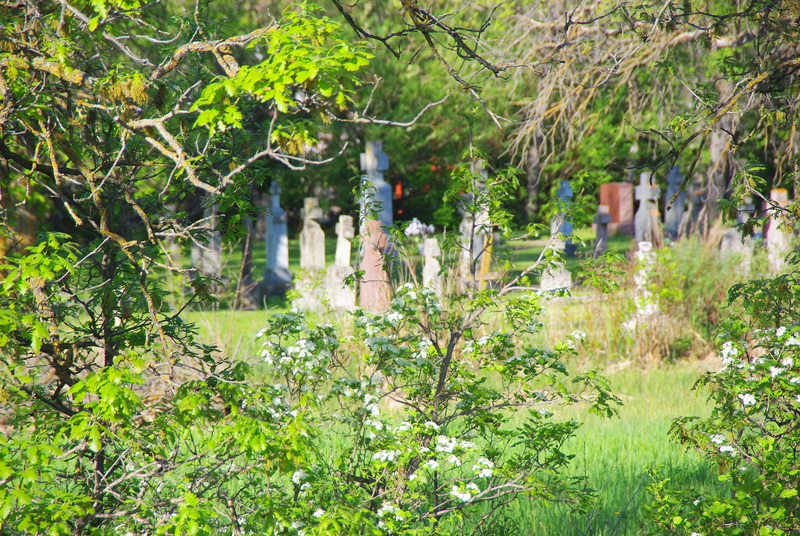 Betty is keeping an eye on me as I trek through the tall grass and weeds over to the church next door to take a stroll through their cemetery. She was hoping I wouldn’t end up with ticks on my legs. Yikes! When I got back from my trek I found most of the girls having their coffee on the porch while we waited to enjoy our breakfast. Or maybe this was after breakfast. Anyhoo I won’t say out loud on my blog what I said to make them laugh. One thing for sure is that we did not go hungry on any day or for any meal! 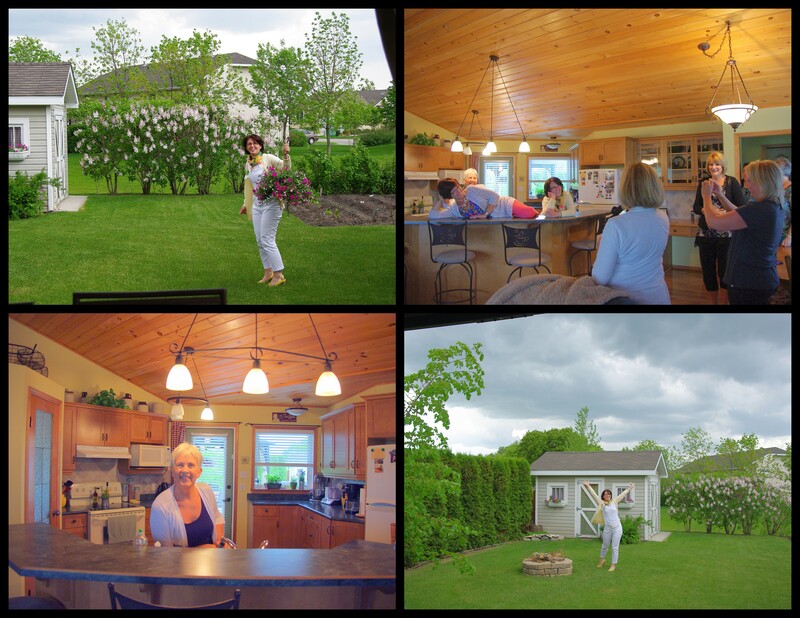 We were able to make a quick stop at Betty’s home and have a little tour to see where she cooks. While we were there a storm blew through and Lovella was excited to get out into it. The reason she’s toting that hanging plant is a whole other story. 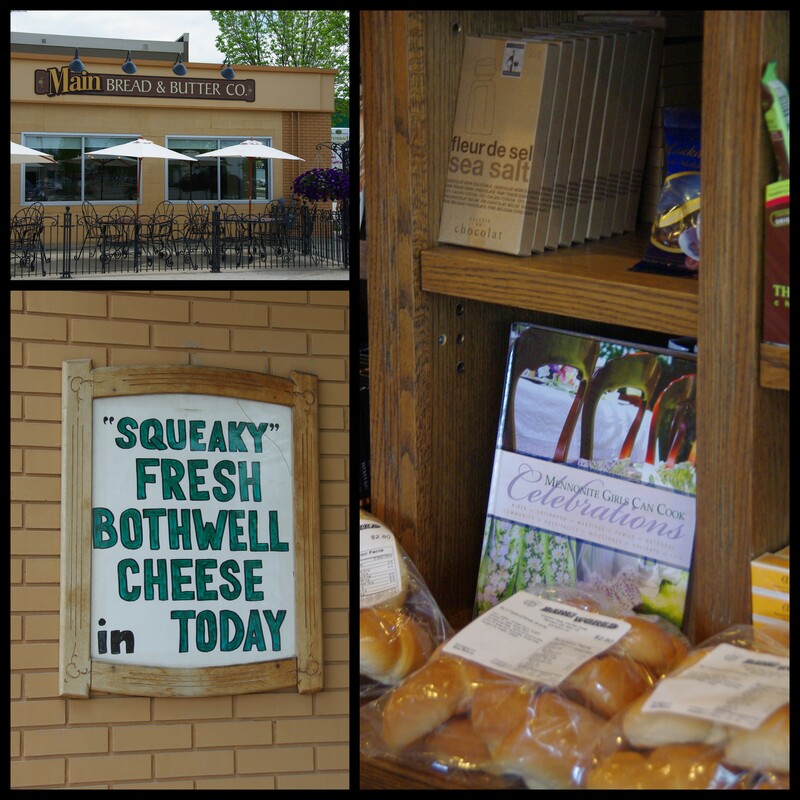 While in Betty’s community we stopped at Main Bread & Butter Co. so some of the girls could buy some famous Bothwell Squeaky Cheese. 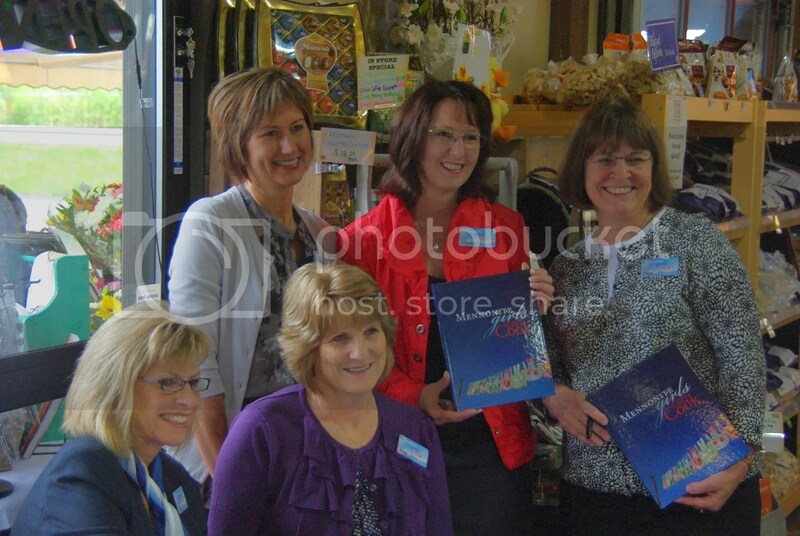 We were excited to see our book for sale on one of their displays. 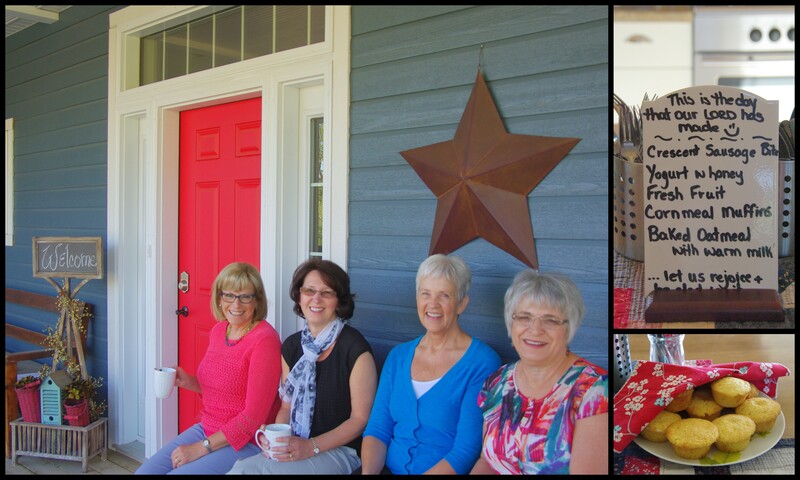 Now we are all the way back to the beginning of our time in Manitoba and our first night at the Women Refreshed at the Well Retreat Center. 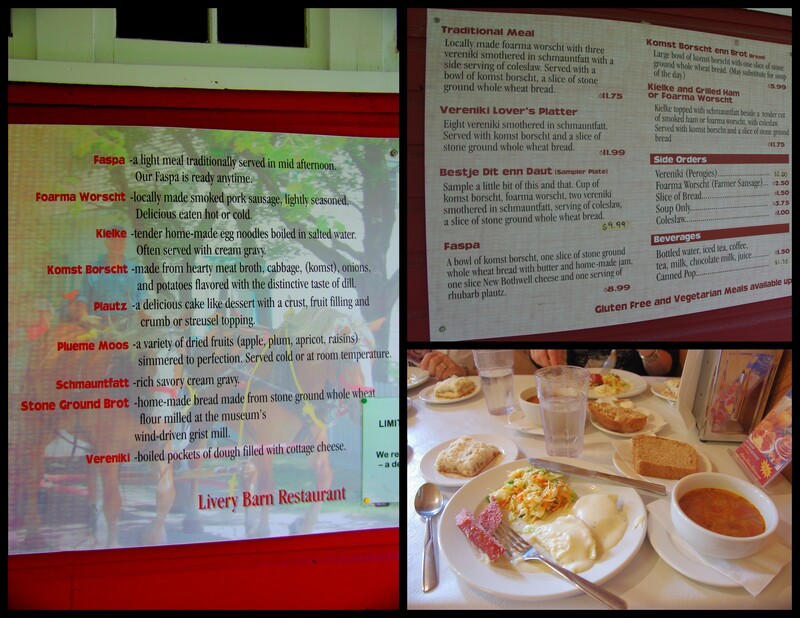 We pretty much started with good food and ended with good food. 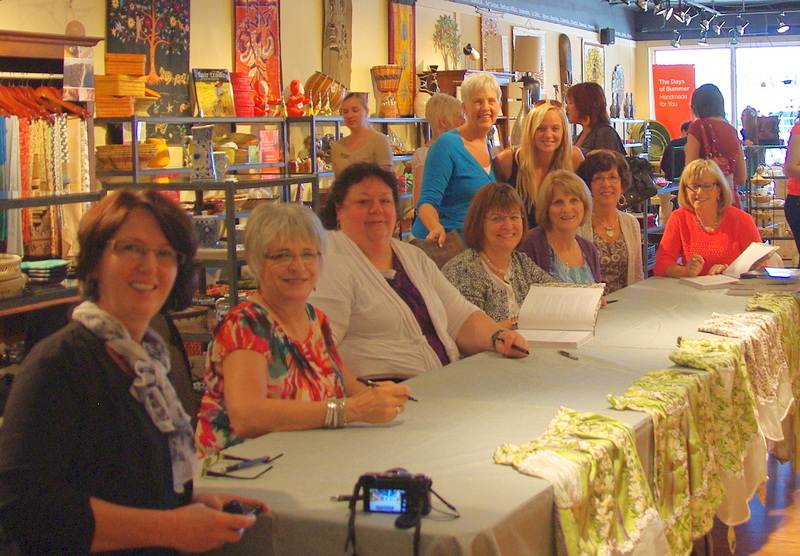 After all…it was a cookbook signing tour. This was Charlotte’s Cake that she made for our dessert on our first evening. 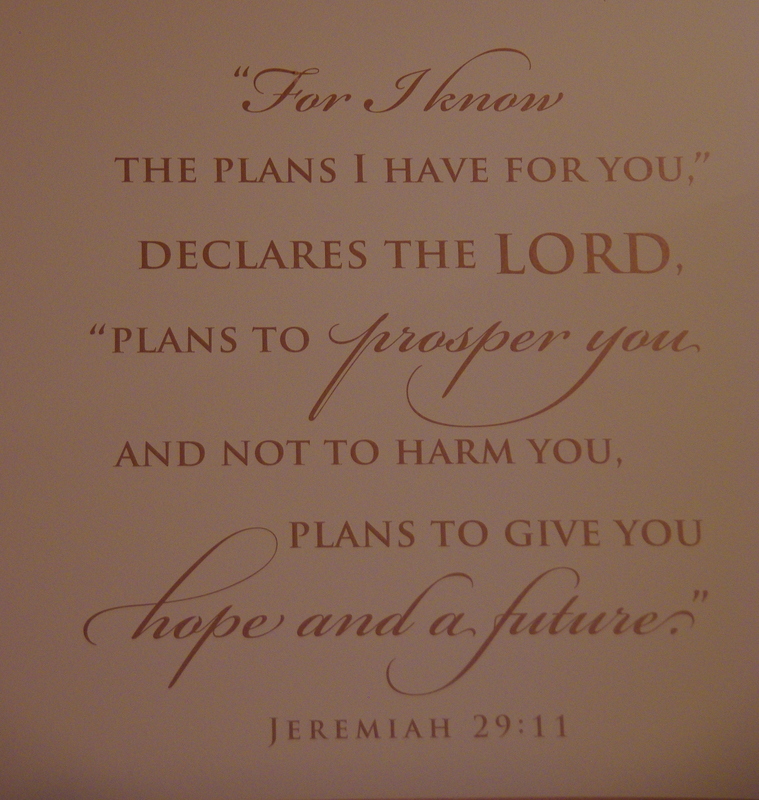 I’ll leave you with this great Bible Verse that Joy had on one of the walls in her Retreat Center. We are grateful to God for all he has done in each of our lives and the great times that we enjoy together. It’s been good to have a large chunk of this week without any plans or appointments. 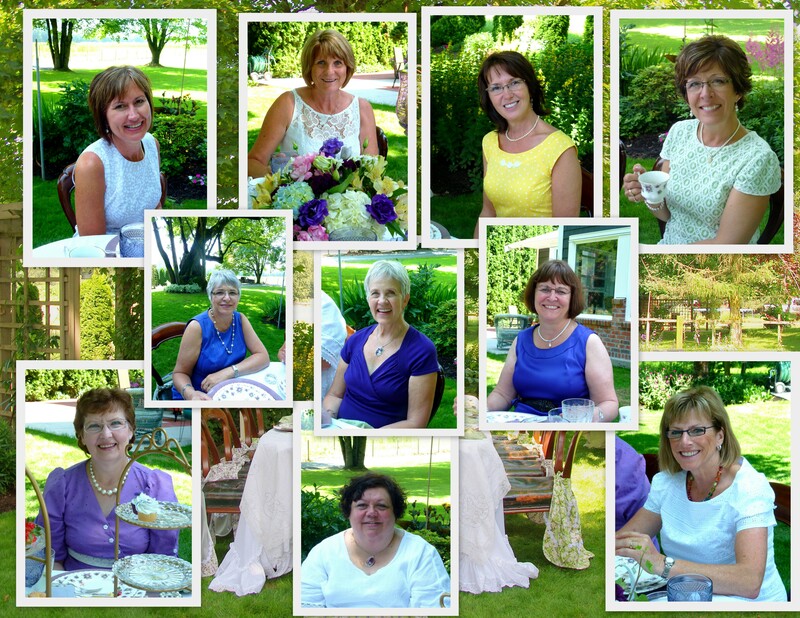 The next thing on the calendar is a bridal shower on Saturday for my nephew’s future bride. Those of us up here in the PNW are happy to be able to attend a family shower without having to fly. We will be flying to the wedding in August that will be in the Santa Barbara area. 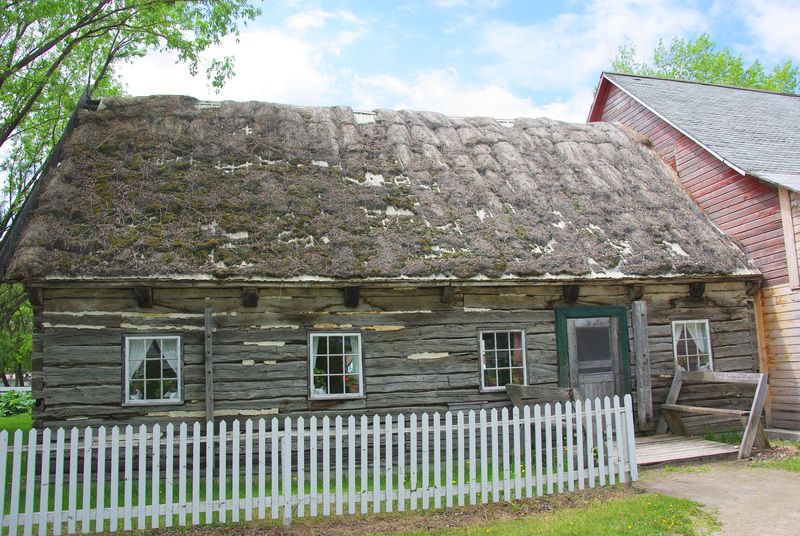 The Mennonite Heritage Village helps preserve the history of the Russian Mennonites. 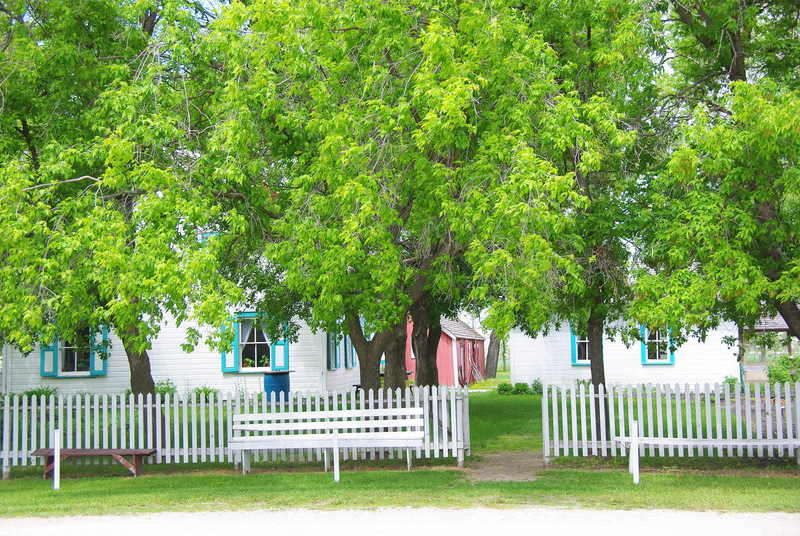 The outdoor village takes you back to 1874 when the first Mennonites arrived in Manitoba. 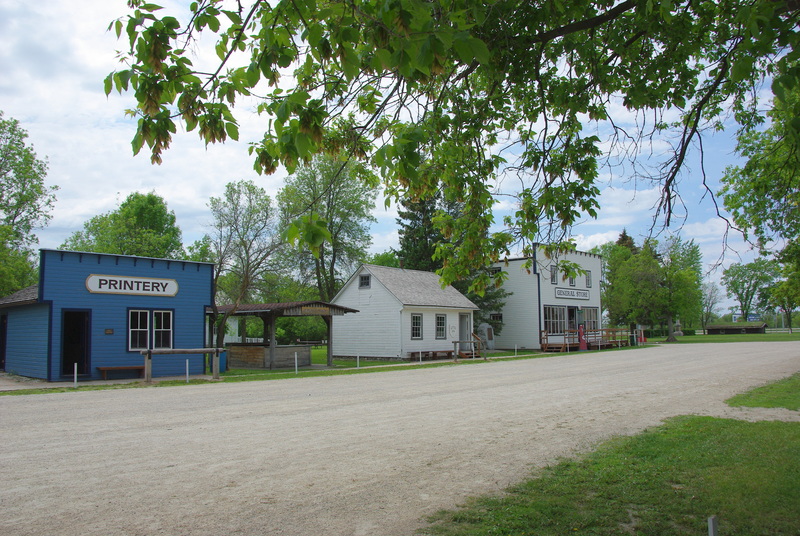 Over twenty historic buildings, including Mennonite homes, schools, churches, and small businesses line the village street. You can absorb the history as you walk through the village and the buildings. 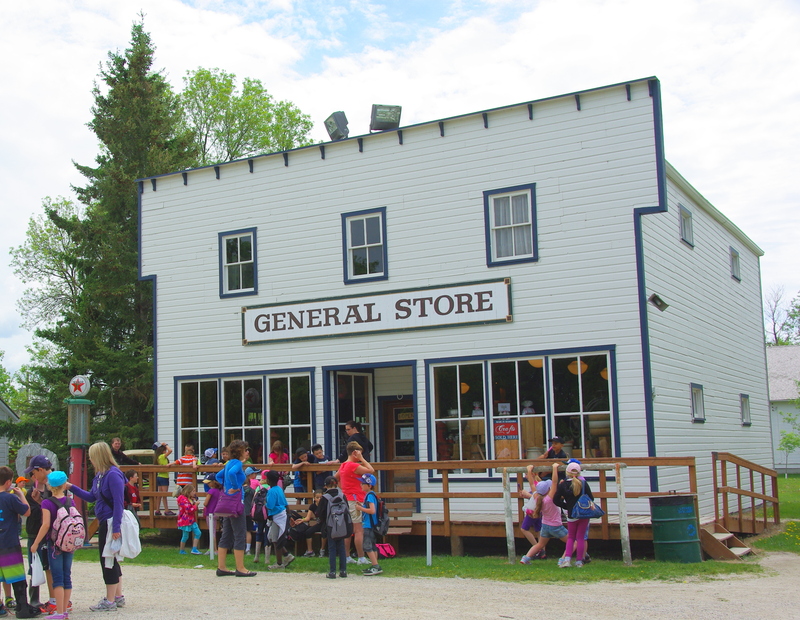 This is a replica of the turn of the century General Store. 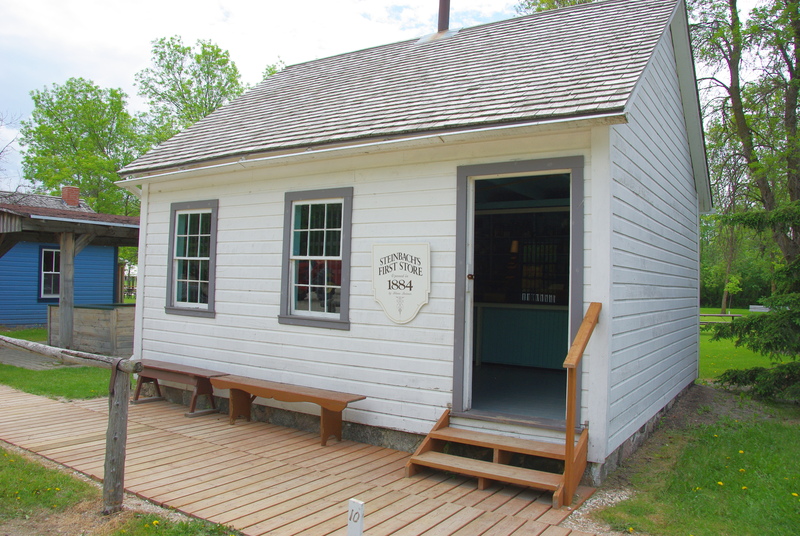 The original Klass Reimer general store was the first in the village of Steinbach back in 1884. 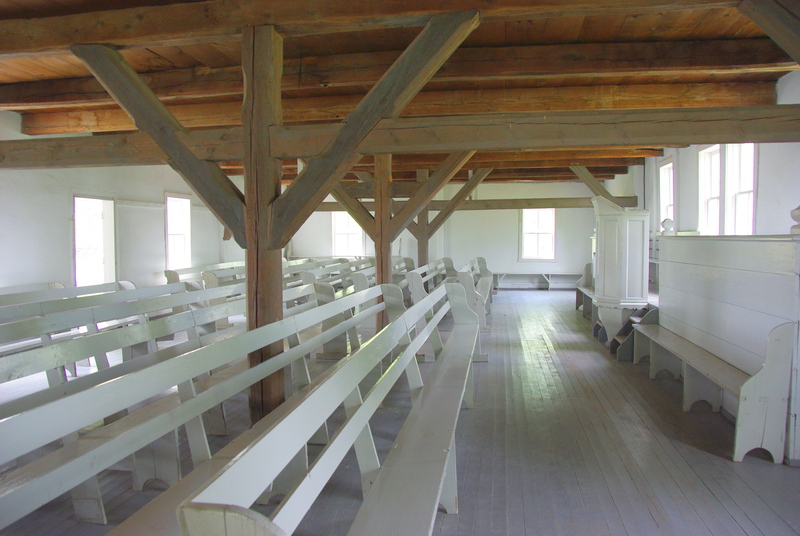 Lichtenau Church was built in 1930 by Mennonites who emigrated from Russia in the 1920’s. We had an appointment at the Livery Barn Restaurant for lunch so I’ll stop here for a bit before we continue our village tour. 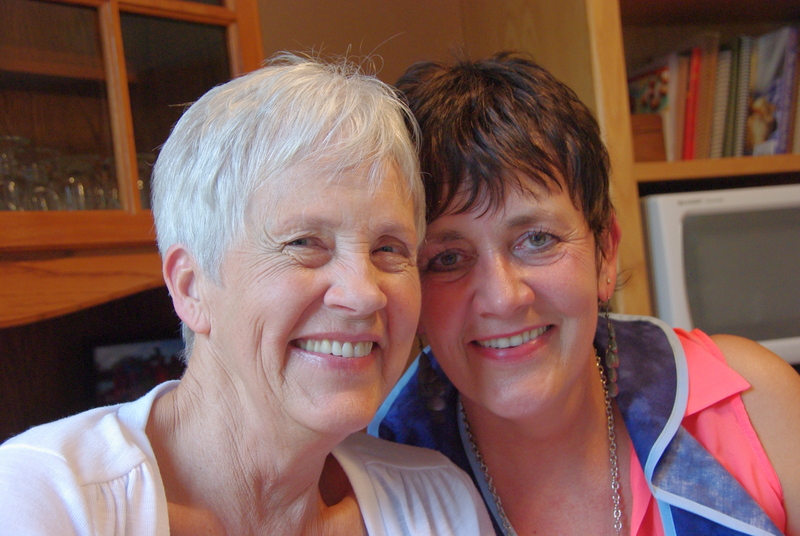 This is Betty and her daughter Allison. All of us chose to order the Bestje Dit enn Daut. Sample of a little this and that. All of this plus it came with a slice of rhubarb plautz. 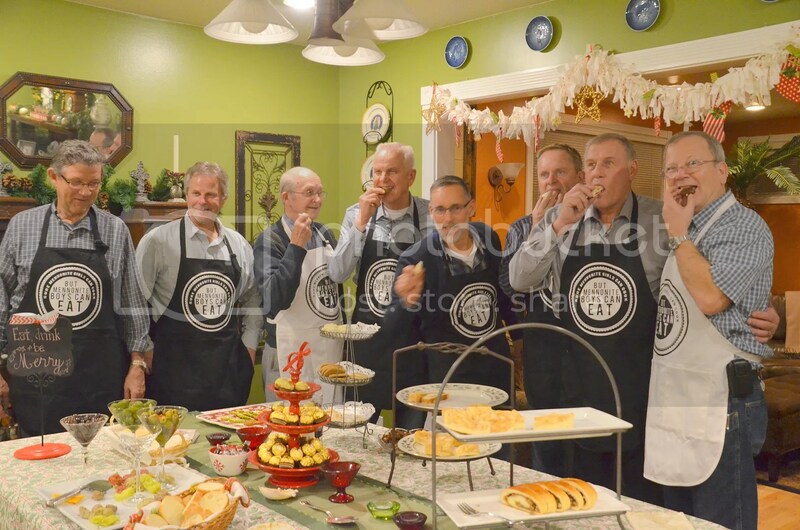 A very traditional Mennonite sampling. 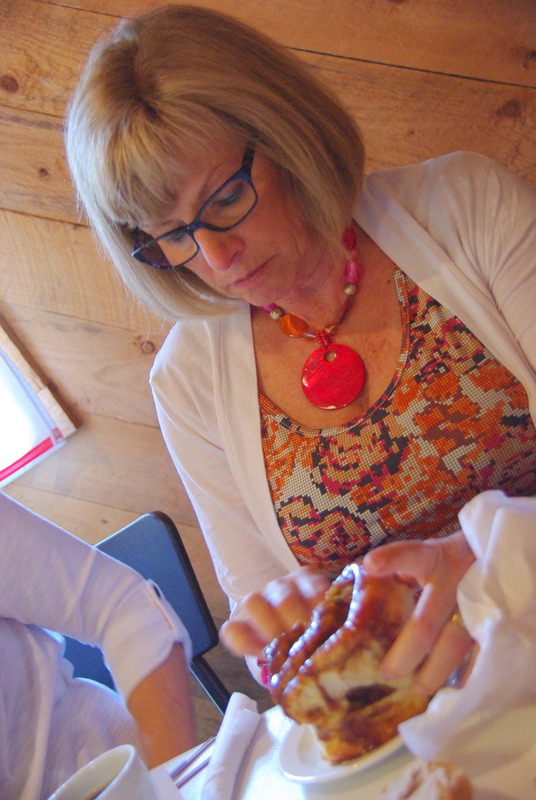 Marg decided we could all sample the Cinnamon roll, too. Yummy! 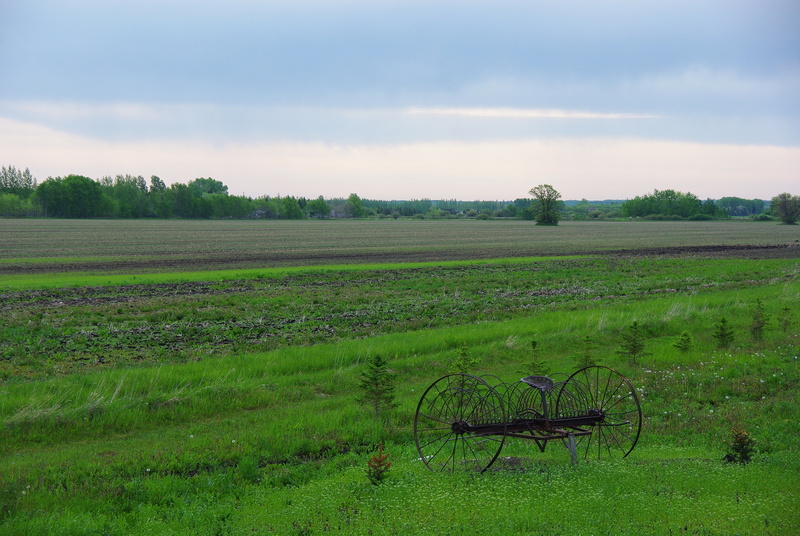 Mennonites used windmills to grind grains and drain marshes throughout their history in Europe and Russia. 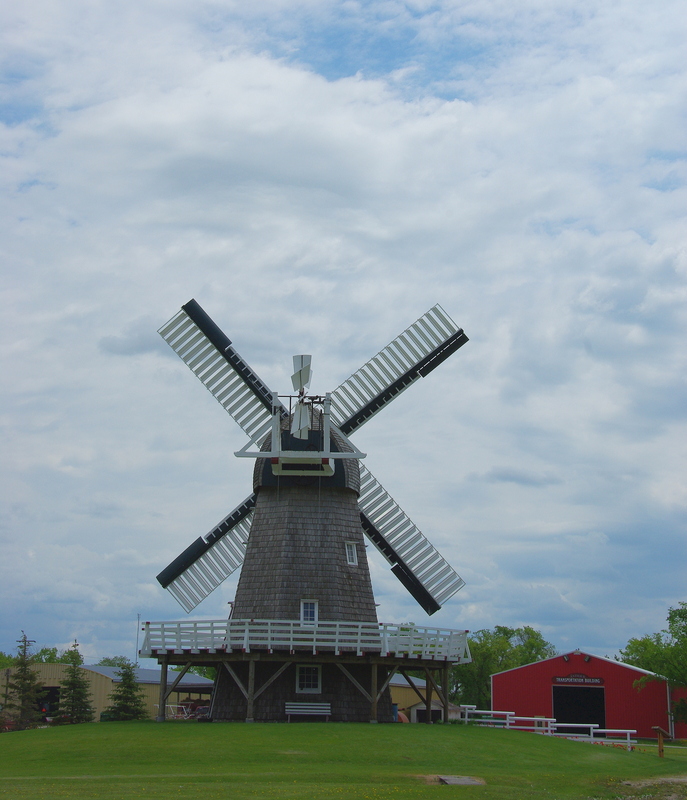 The first windmill in Steinbach was built in 1877 by Abraham S. Friesen. A replica was built at the museum in 1972 but was destroyed by fire in 2000. 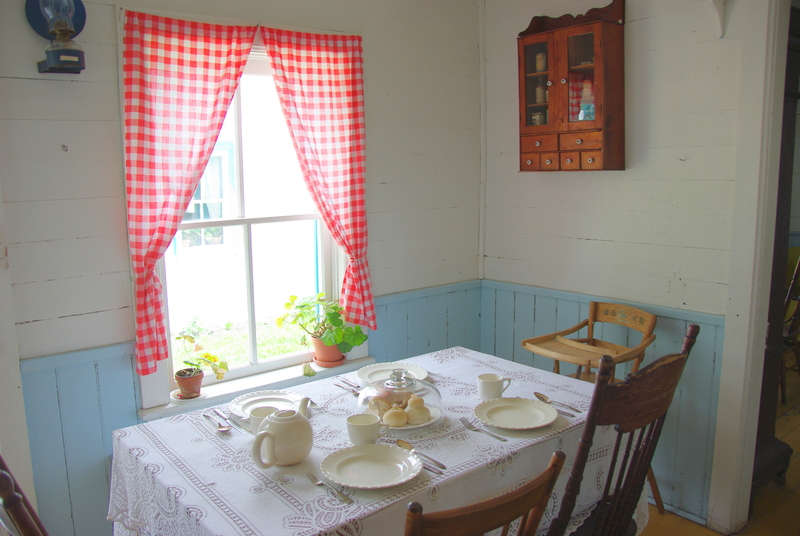 Now Canada’s only operational windmill, reconstructed in 2001, is an exact replica of the 1877 windmill of Steinbach and sits in this village. 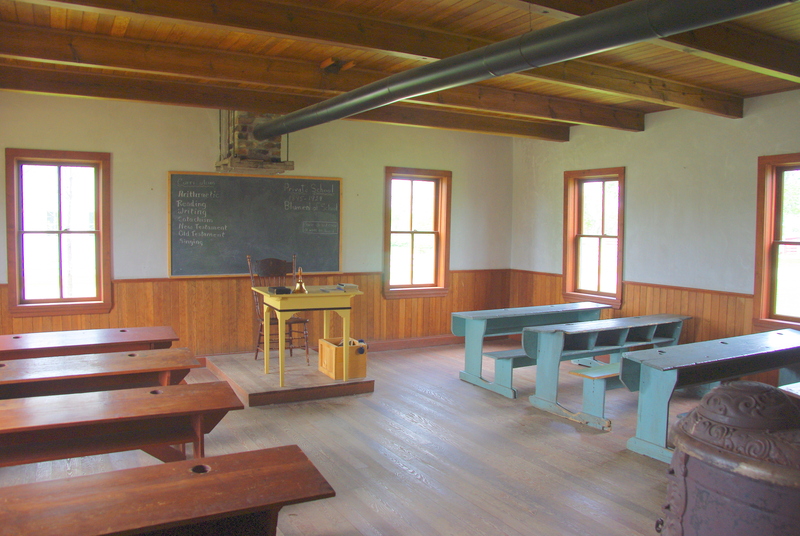 We didn’t have enough time to walk into all the buildings but I was interested in seeing the inside of one of the school buildings. 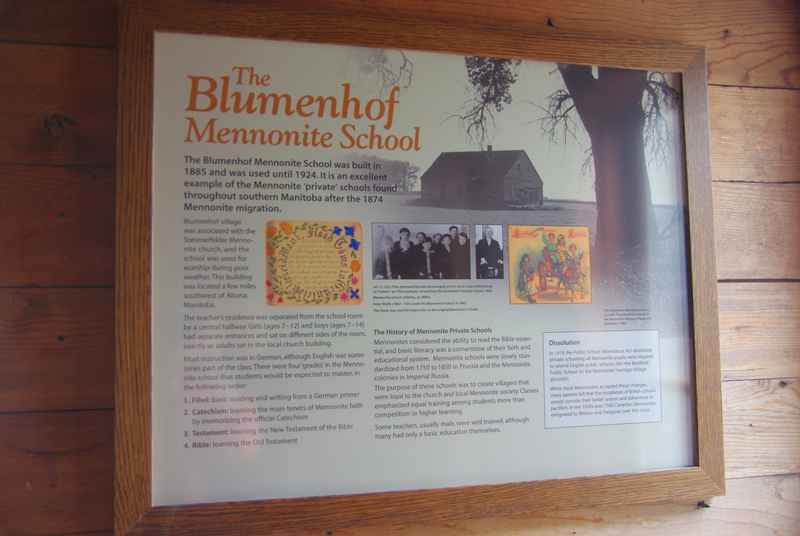 This school was built in the village of Blumenhof, near Altona, in 1885. 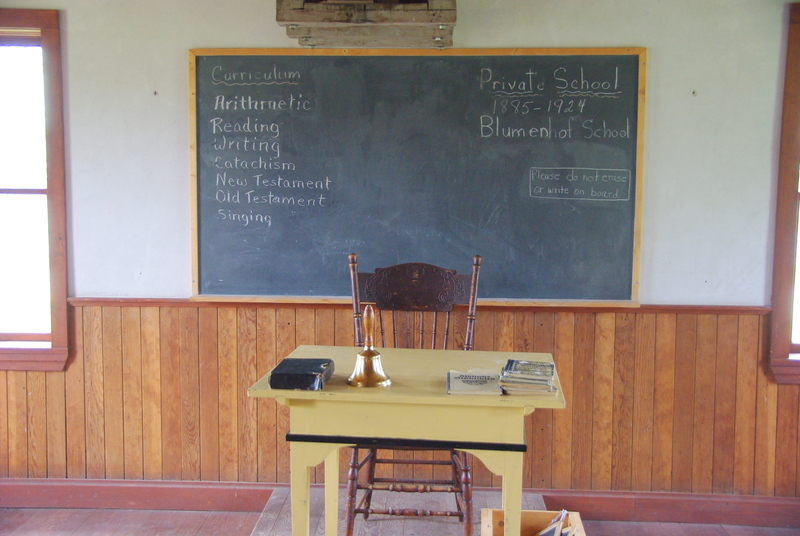 Dear’s mother taught in a one room school house and I can imagine it was not unlike this one. Lunch boxes or I suppose they should be called Lunch cans! 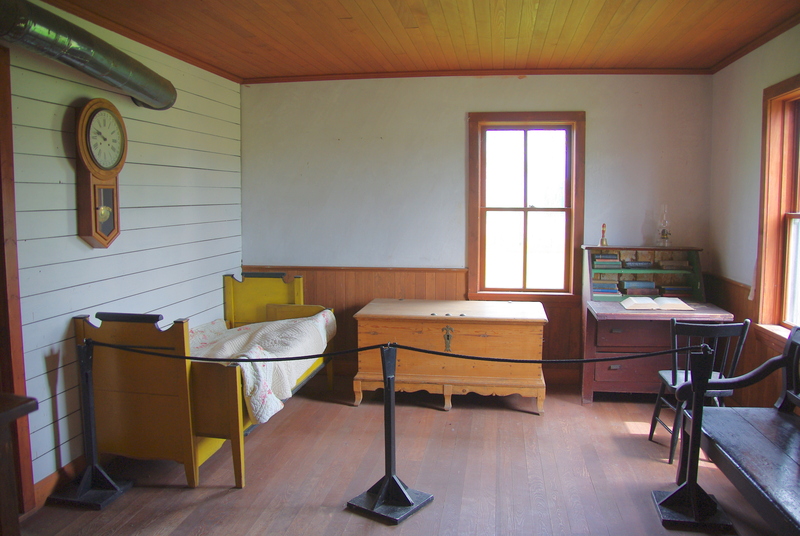 The teacher could live right in the school in an adjoining room. I think I would have preferred to have quarters elsewhere. 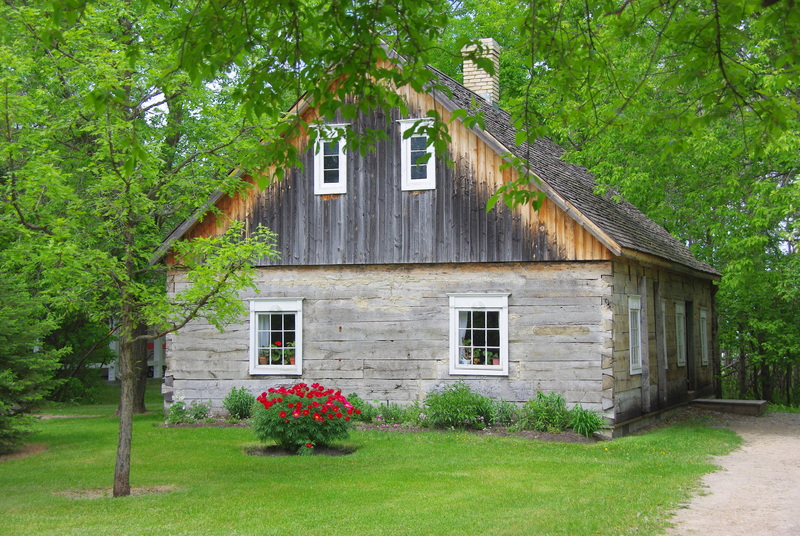 The house and barn connection and dwelling layout of this home can be traced back to Prussia/Poland, where the Mennonites settled from the 1500’s onward. 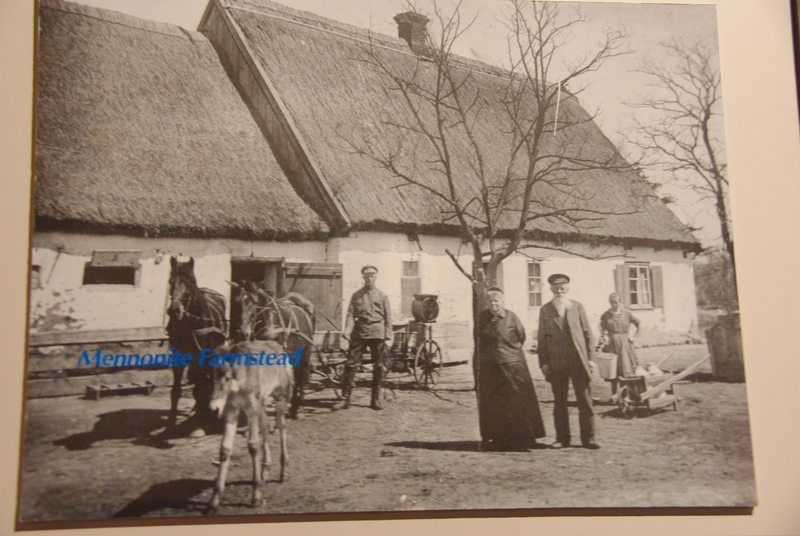 This is a Semlin which was made of sod, soil, grass and wood. 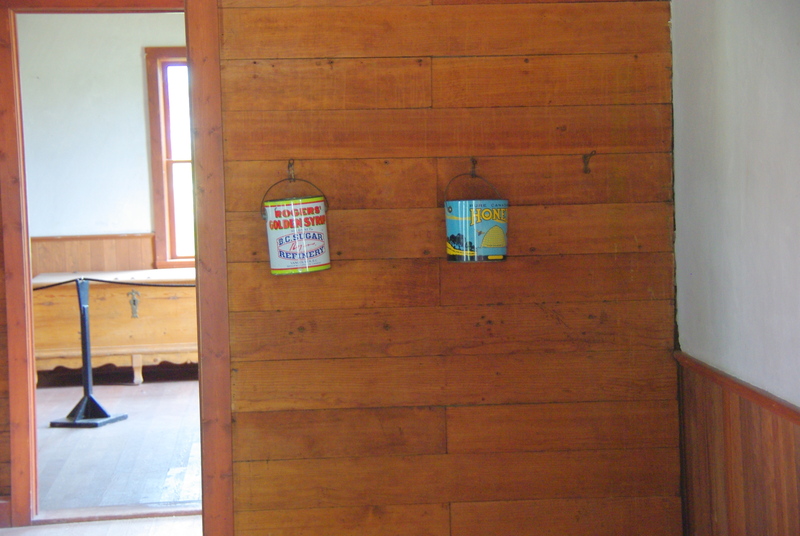 These were the materials used in the first homes bulit by Mennonite immigrants in 1874. 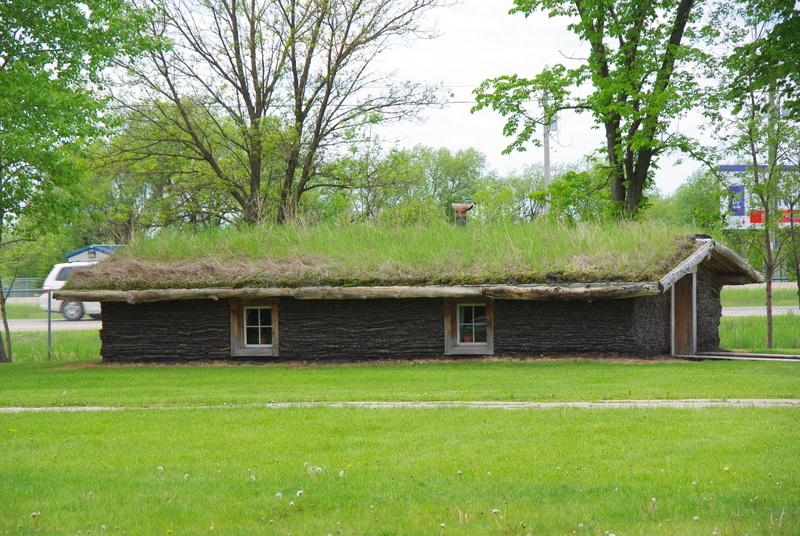 Although very crude, these sod buildings provided the shelter necessary for survival on the Manitoba plains. 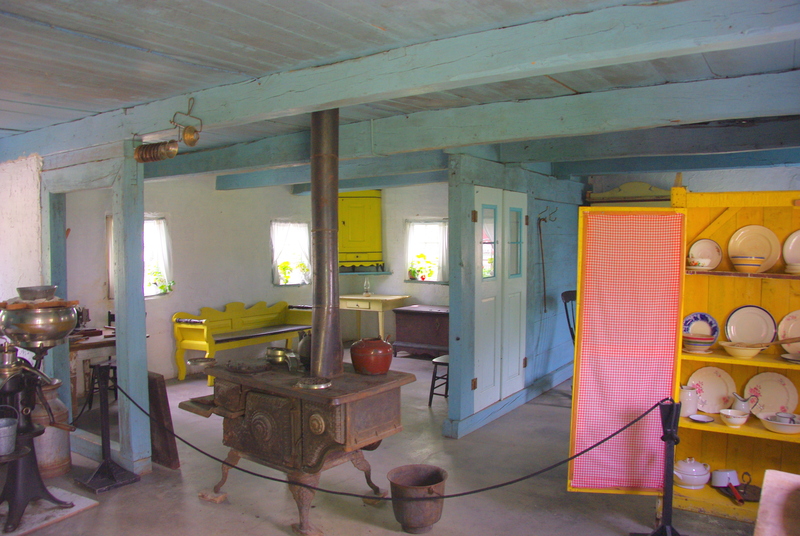 The house above and below this Semlin was a vast improvement built with oak logs and larger rooms. 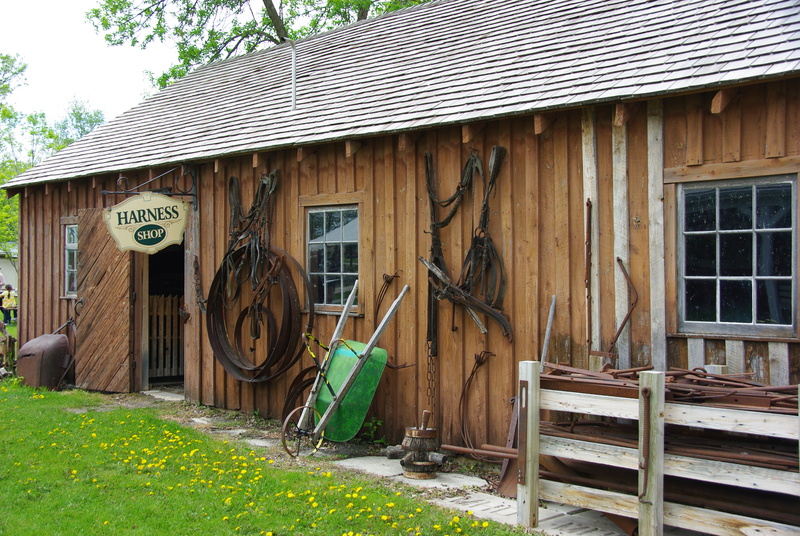 Hope you enjoyed my little tour of the Mennonite Heritage Village. Putting something together on this scale must have taken lots of hard work and volunteer hours. 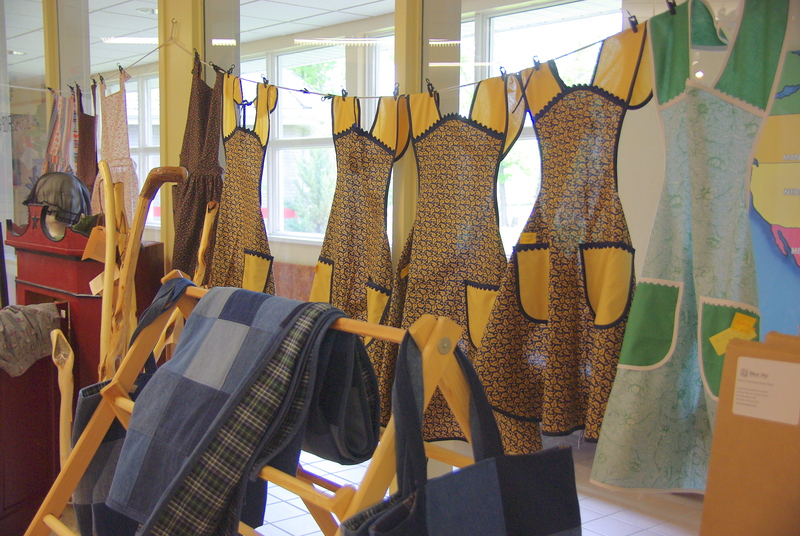 From what I’ve seen and experienced, Mennonites aren’t afraid of hard work. Volunteers put in hours to mow the lawns on this 40 acre site, too. It really is a great destination to visit if you travel in this area. 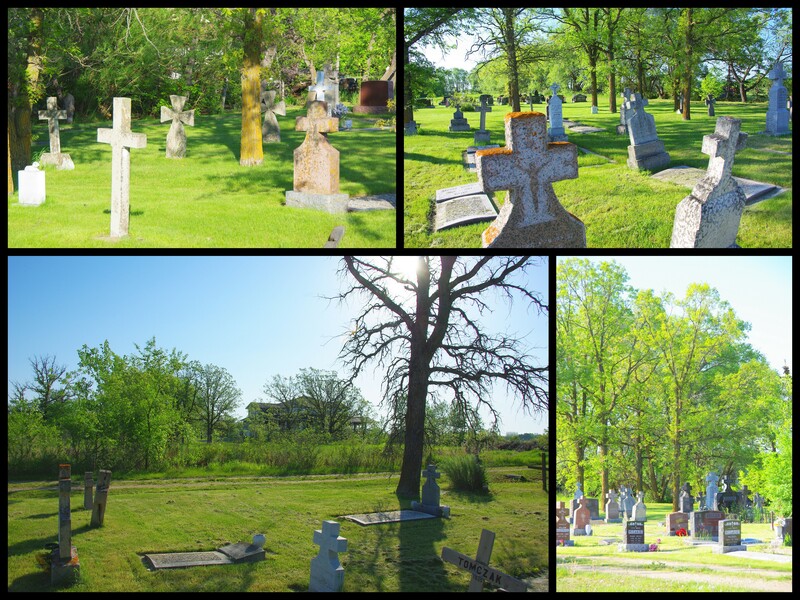 I have one more post to wrap up our time in Manitoba. 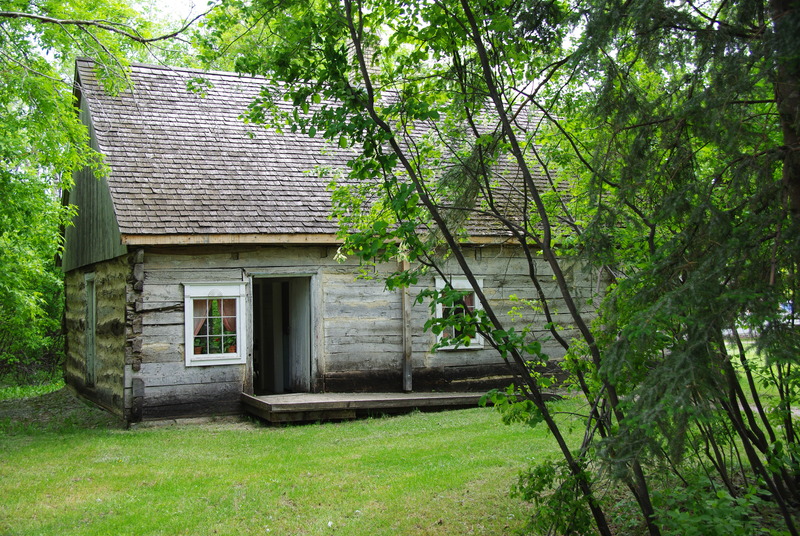 I had no idea of the scope of the Mennonite Heritage Village in Steinbach. When we pulled up in front I still didn’t realize what was waiting to explore within and beyond the museum building. 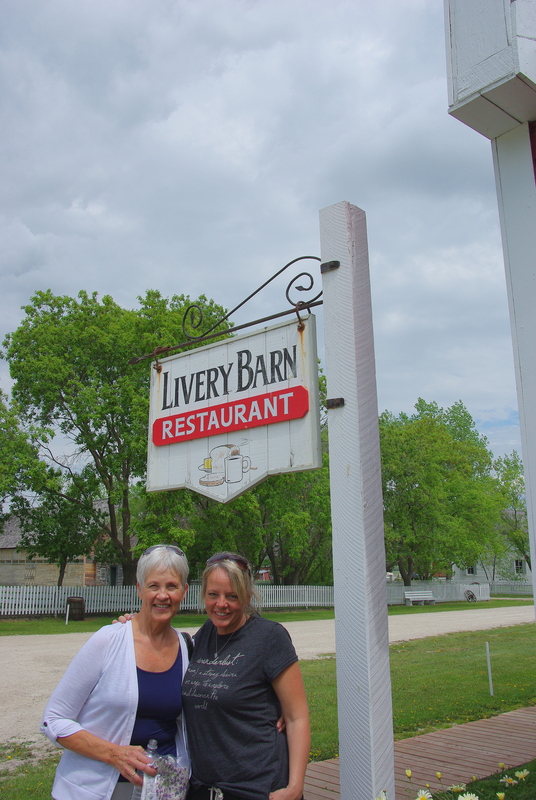 For this post I’ll just share the Center and the Museum with our signing photos and in another post I’ll share the Village and the Barn Restaurant where we enjoyed some heritage food. 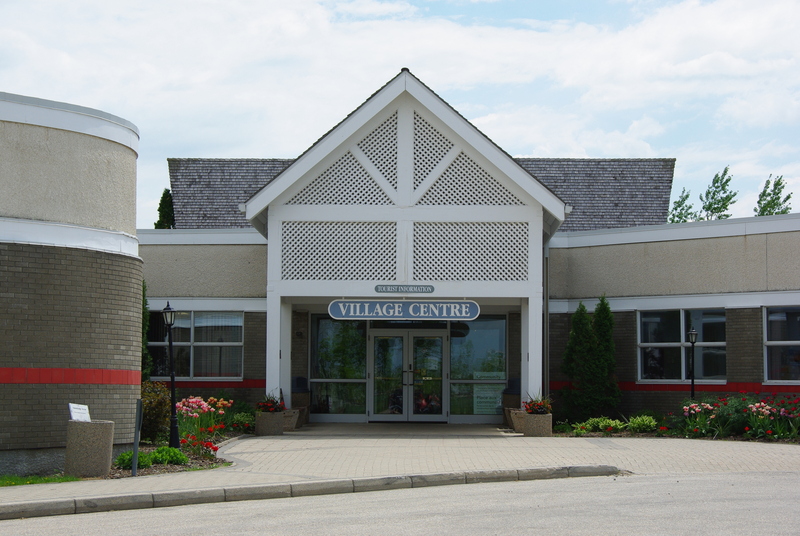 The Village Centre contains the main exhibit telling the Mennonite story from the 1500s to the present. The whole time we were in the center signing books there was a steady stream of elementary students arriving in school buses to have a tour of the center and village. 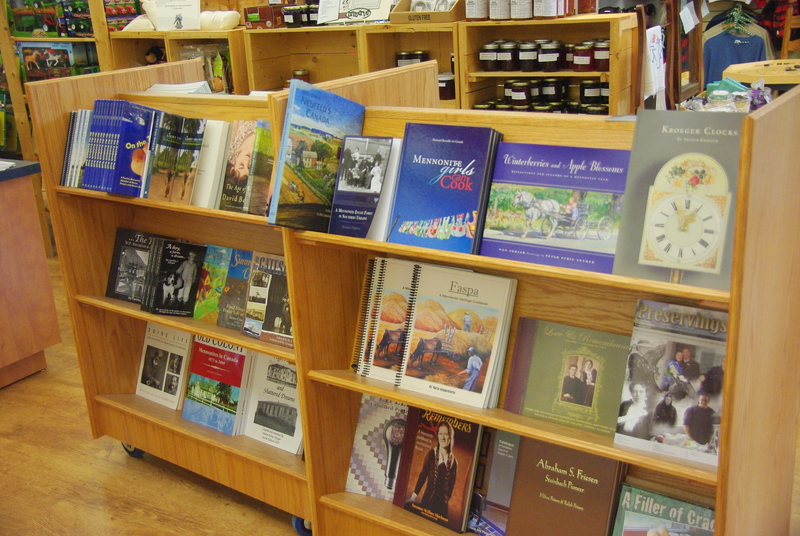 The Museum gift shop had a great collection of Mennonite books and they had our cover aprons from our first cookbook for sale in different fabric patterns. 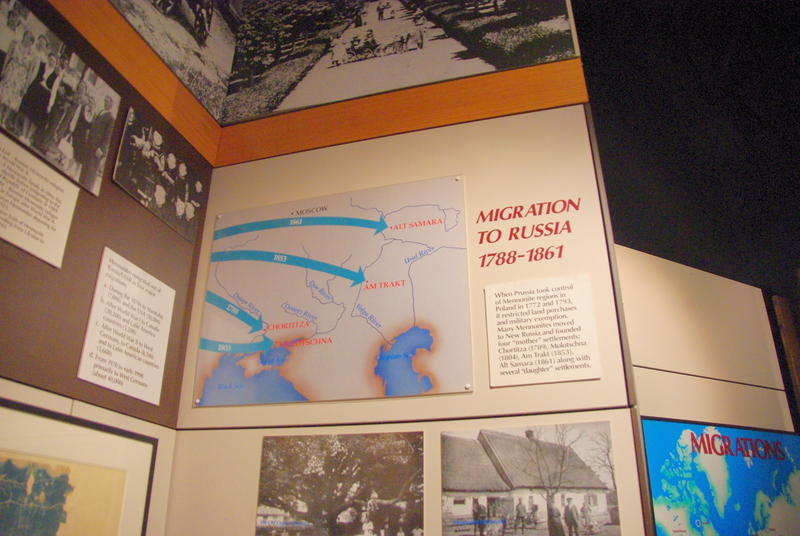 A walk through the museum took you on a time line of the migration of the Mennonite People over the years. 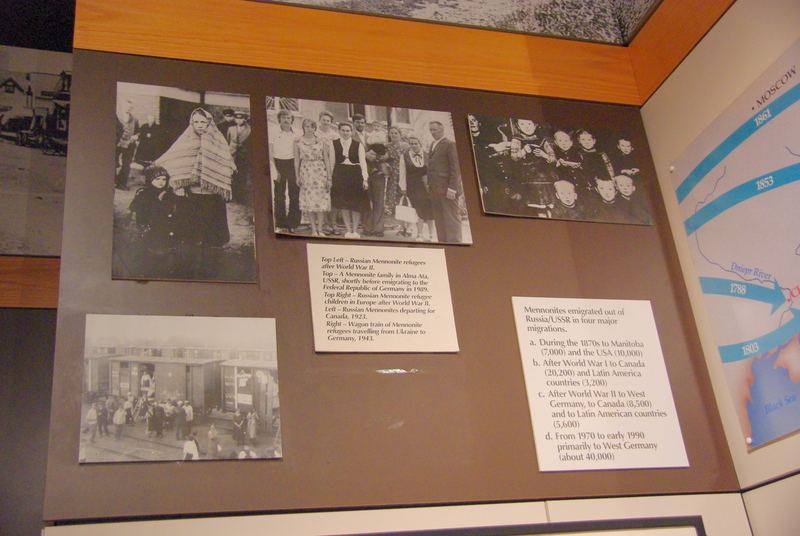 There were many great photos and items from Russia in the museum. 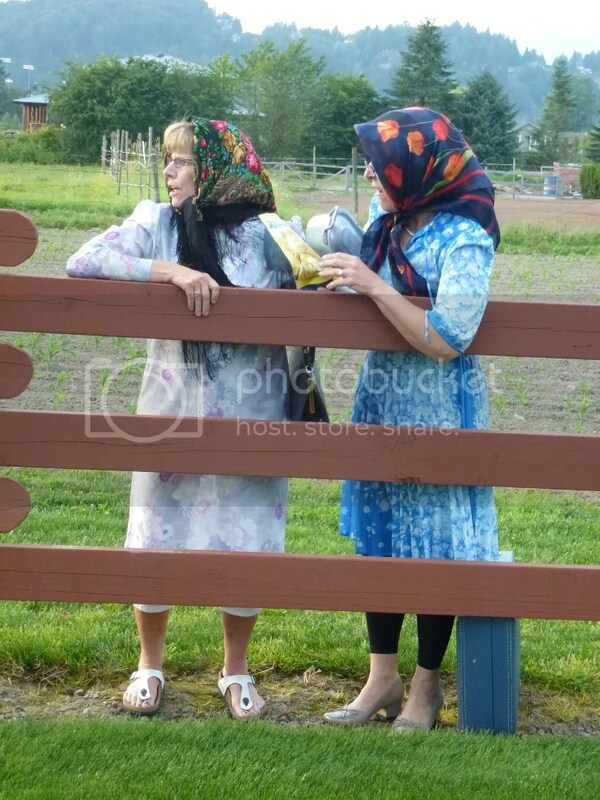 Even though I am not Mennonite these photos could have been a photo of my relatives from Russia. They look so similar to the few photos we have from our ancestors in Russia. 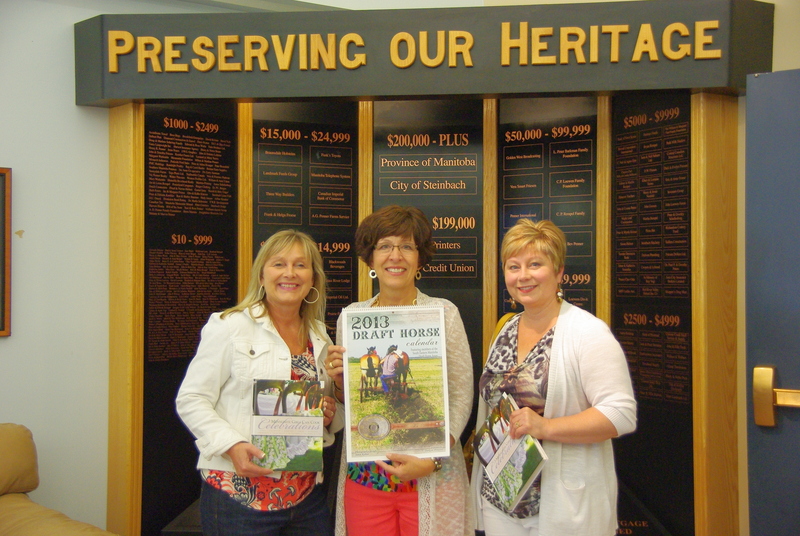 Kathy’s cousins came to the center and it was fun to take this photo with Kathy holding her cousin’s Draft Horse Calendar that is sold in the Heritage gift shop. 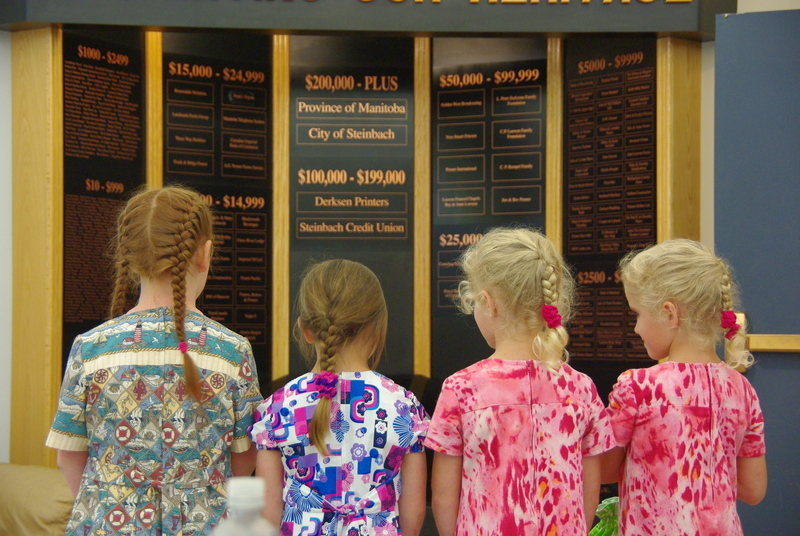 How cute are these little girls with their braids? We asked permission to take their photo. It was fun to meet Jeanine from The Baking Beauties who is actually only one baking beauty right now. 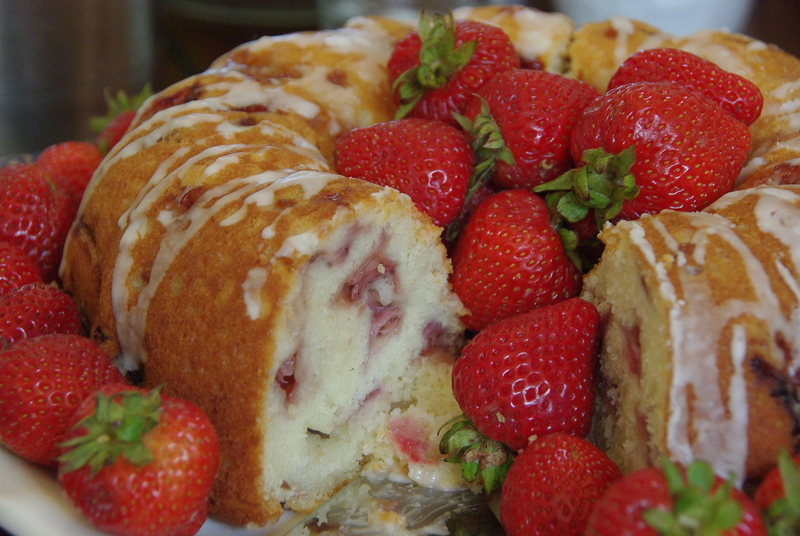 She has a great Gluten Free Baking sight and you can click over to check it out. She’s in the middle in the back row. When we were done with our signing slot we headed out the back doors of the center and I was pleasantly surprised with the sites I saw. I will share more in my next post. We are busy now working on options for easily storing some of our larger pieces of furniture while we have all of our floors replaced. 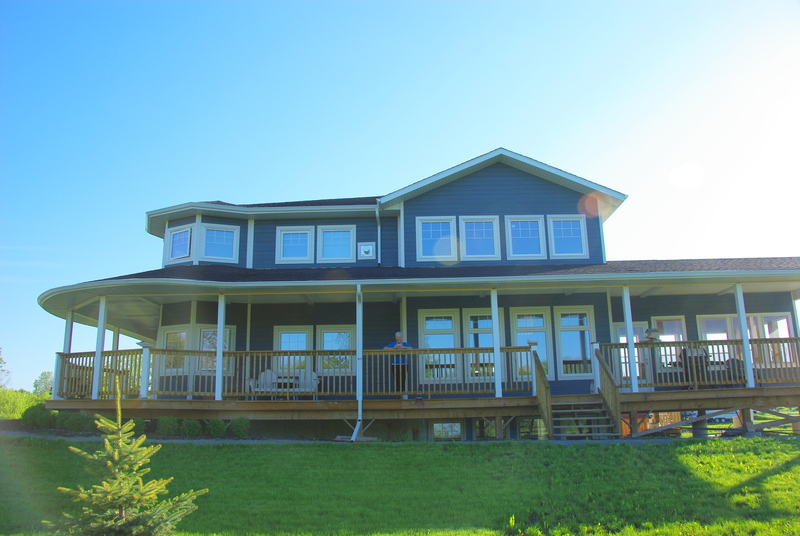 We are having it done in two stages and will be moving things in and out for the hardwood floors first and then following up with the carpeting. We are still trying to choose the color and pile we want on the carpeting. Everything you do opens up the door to more things that need to be done. 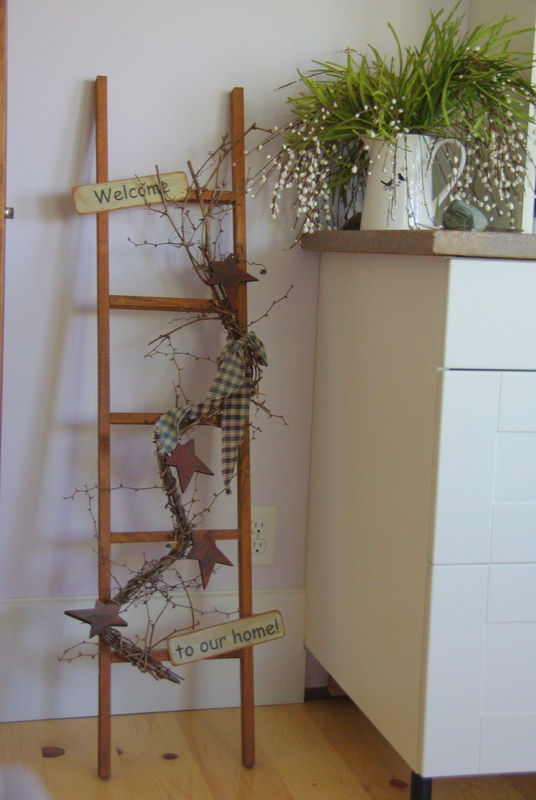 Any big projects at your house? Everywhere we went in Canada I was struck with this greeting “Welcome Here”. It’s not a greeting used across the board in the U.S.A. but I’d love to start using it at my house. 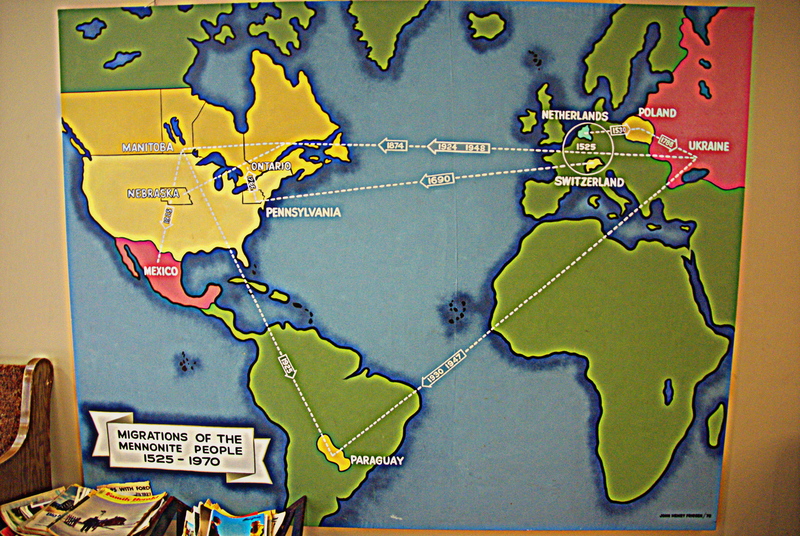 This post is about the places were were “welcomed here” apart from our book signing locations. 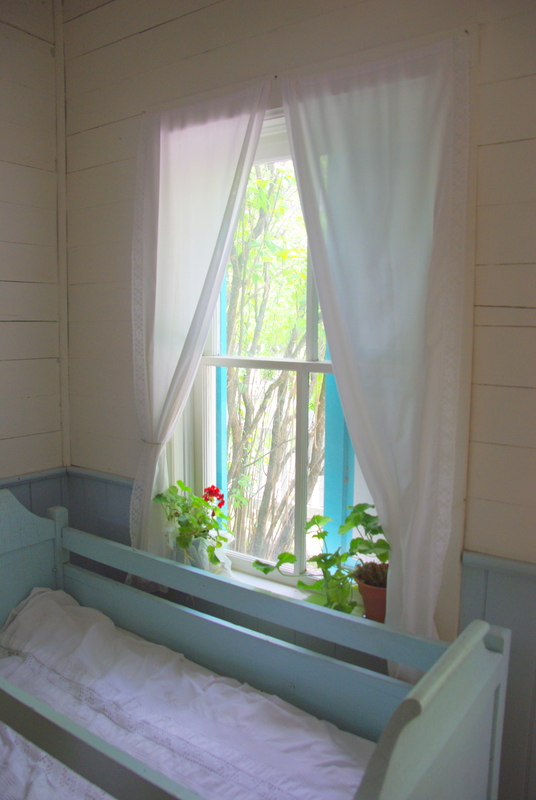 I’ve already shared about Charlotte’s home and our wonderful lunch there. 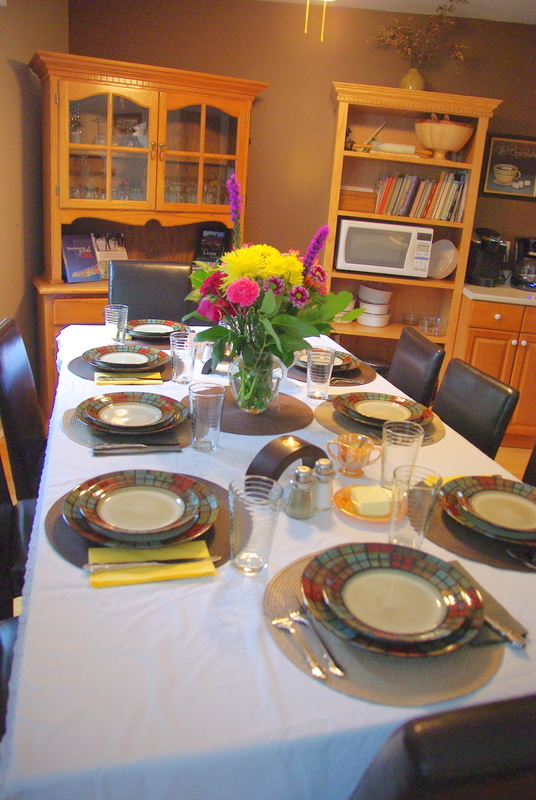 A lovely table set for all of us with appetizers before our main meal began. 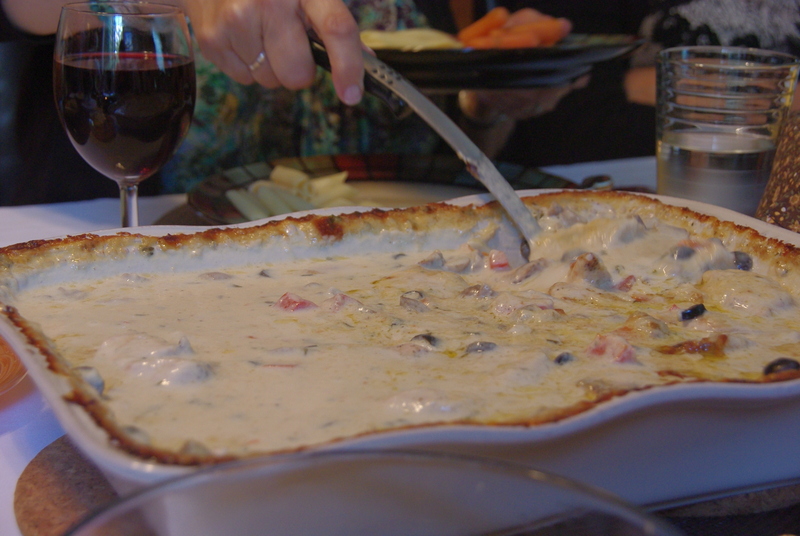 All Eight of us tried to trick Norma into giving us the recipe for this delicious pasta dish she made but she held her ground and kept her secret…so far. Time will tell if we can replicate it! 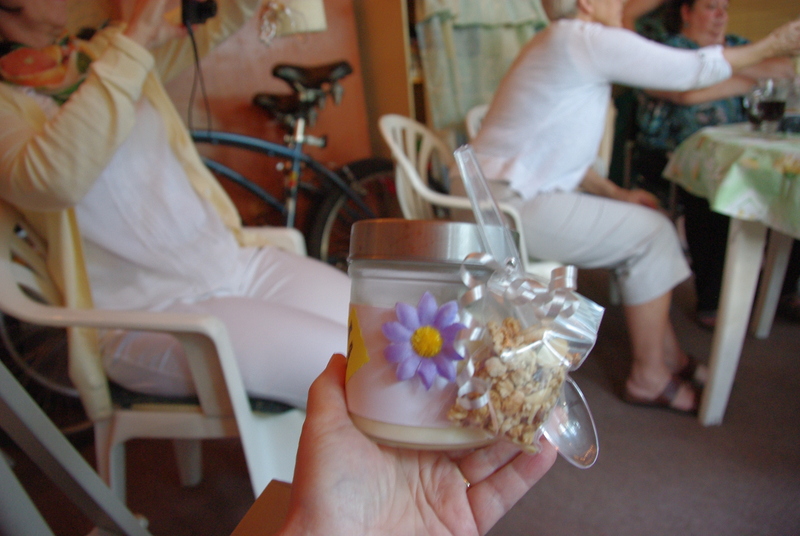 We were going to take these great little pudding/yogurt pies home with us to have at our retreat center but it turned out that we had time enough to eat them in the Sun Porch. Delicious! Aren’t they packaged nicely? That little pouch on the side is granola. 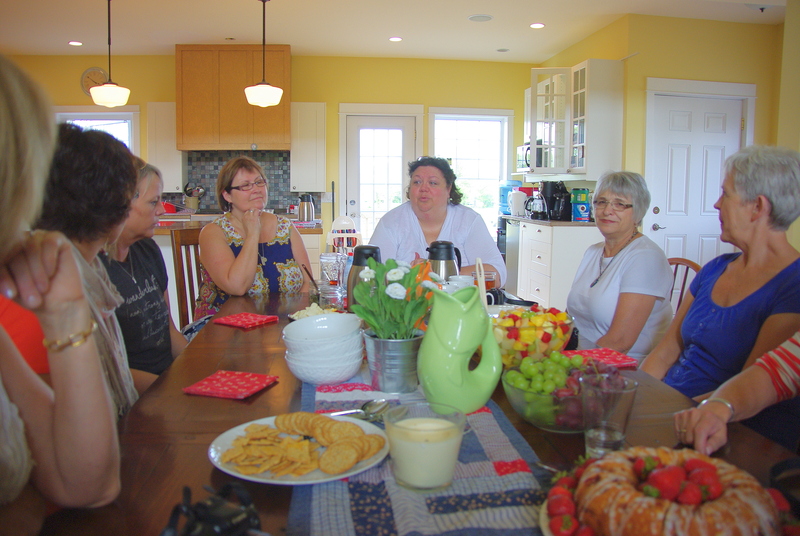 We were so glad to be able to spend time with Betty’s sister and Jack. Thank you so much for welcoming us here! Aren’t these sisters beautiful!? 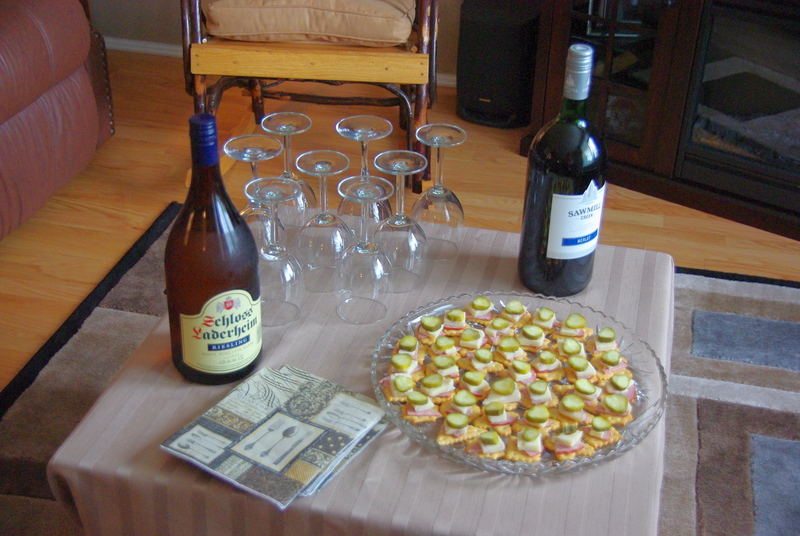 Dear called from France today and it was so good to hear his relaxed voice. Things are a little quiet at his conference since so many travelers were delayed because of air traffic strikes in France. He’s eaten some Octopus and a Risotto dish that he sent me photos of. He sees me take so many photos of food that it has rubbed off on him. 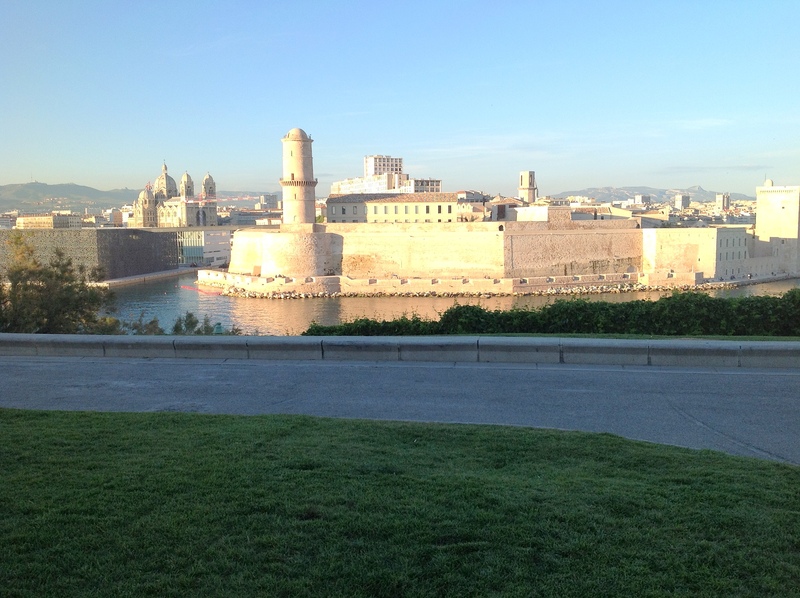 Here’s a photo that he took just outside the conference center. Tuesday night I was able to do something that qualifies for my bucket list and I’ll be sharing the experience really soon with lots of photos. 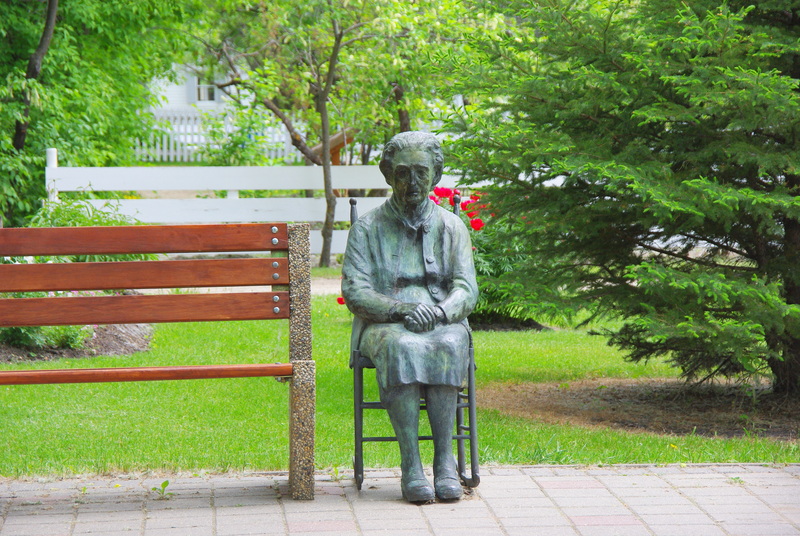 I’m a bit dizzy headed and hope to have some clear thoughts soon to share about all the wonderful people we met and places we saw while in Winnipeg and Steinbach. 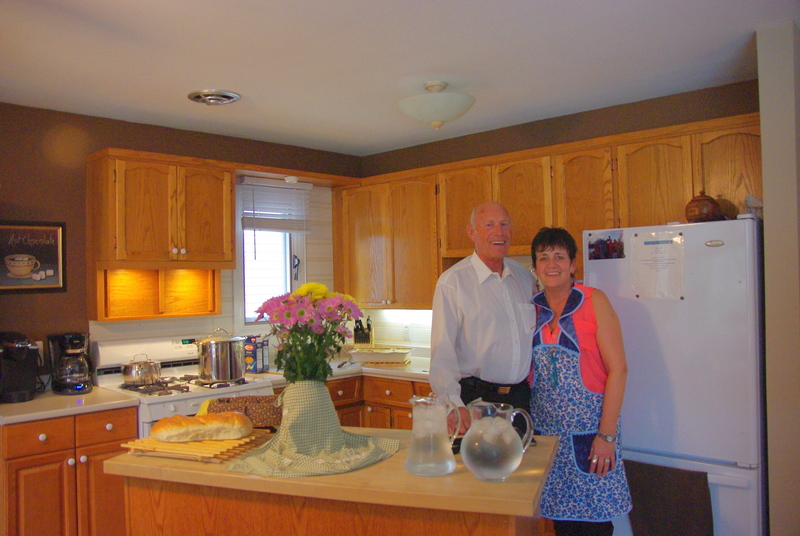 We arrived from Winnipeg back to Abbotsford late on Saturday night and after a quick sleep at Judy’s I drove home to Seattle. 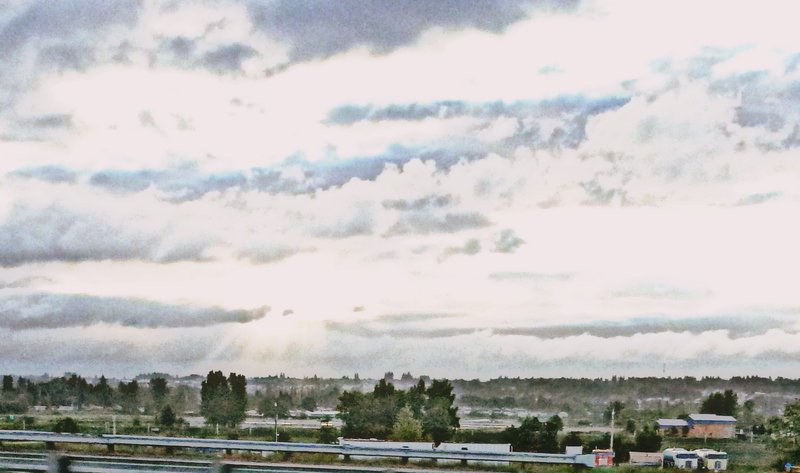 I pulled into my garage at 6:30 a.m.
A doctored up shot of the sunrise from I-5 this morning. After a full nights sleep tonight I’ll be catching up with what I’ve missed while traveling cyber free. …and I’m sure we’ll be eating, too. I wonder if these gals will be hot on our trail? We never know where they might show up. If you live in this area, we would love to meet you! I’ll mostly be off-line until Sunday. Hope your week ends well!